Facilitated by Valerie Mace – Friday 25th May 2018. Participants: Students from the MA Narrative Environment course at Central St Martins. 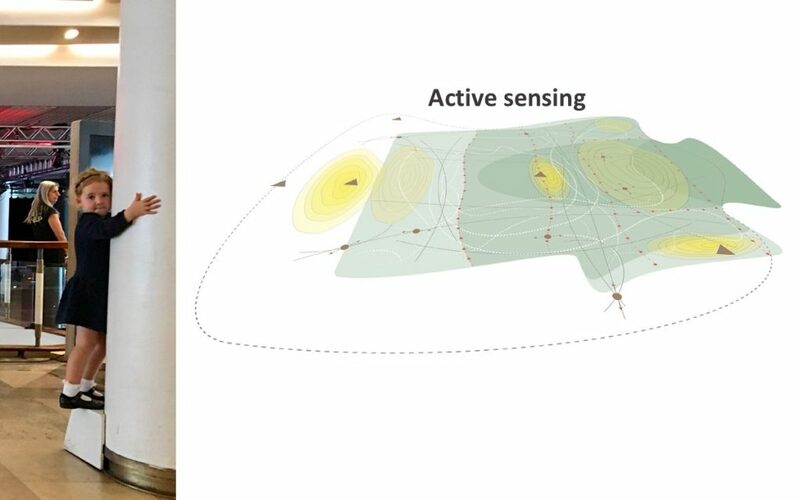 In this workshop, an introduction to active sensing, you are invited to document sensory impressions across an environment defined as the dynamics of the physical space and people within it. The tools used in the workshop are designed to help you quickly familiarise yourself with the environment and become more conscious of your sensory impressions. 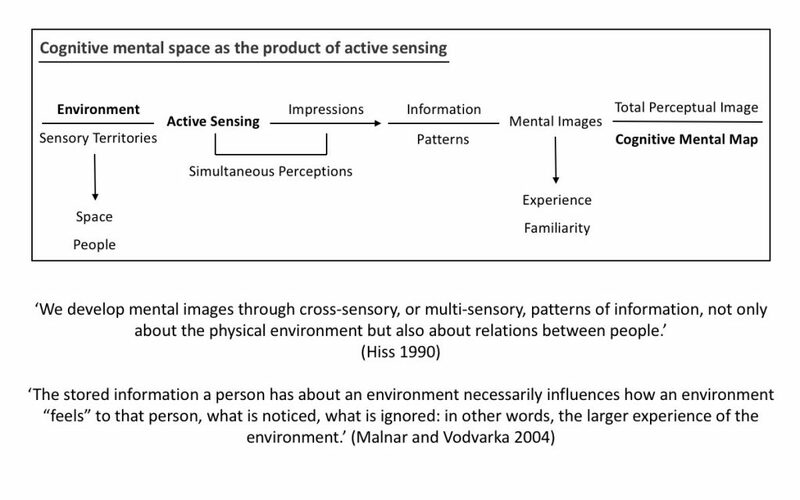 Understand the relevance of active sensing in environmental cognition. Unlearn sensory inhibitions, learn to sense information in space. 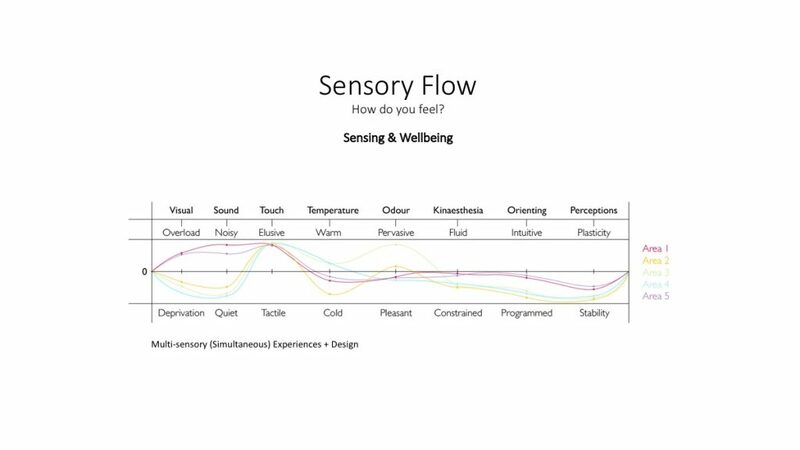 Explore impressions that emerge from sensory information. Be inspired by the sensory environment. A4 sketchbook, a few sheets of tracing paper and 1 bulldog/foldback clip to secure the tracing paper to the sketchbook. Different colour pen: black, red, blue, green, orange, purple. You will be working individually within a site pre-selected by your tutor. 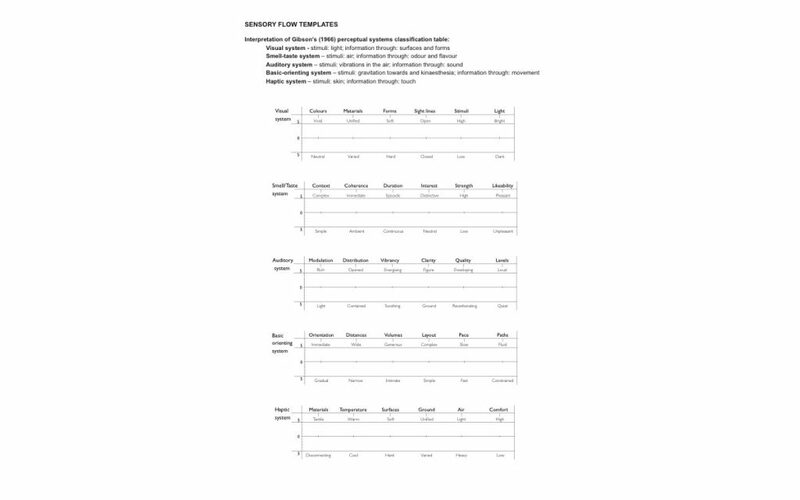 Work quickly: document your initial impressions as they occur and allow the flow of sensory impressions to guide you. 01. Discover-Walk through the site to immerse yourself into its sensory environment(space and people) and to familiarise yourself with it. Don’t just look, use all your senses: smell, taste, touch, listen and notice how you move. 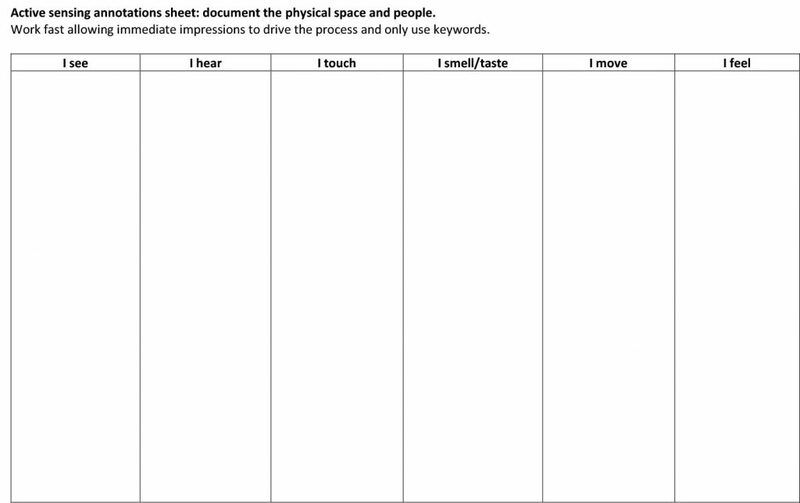 Use the Active Sensing Annotation Sheet to capture key impressions. 02. Document–Find a vantage point. 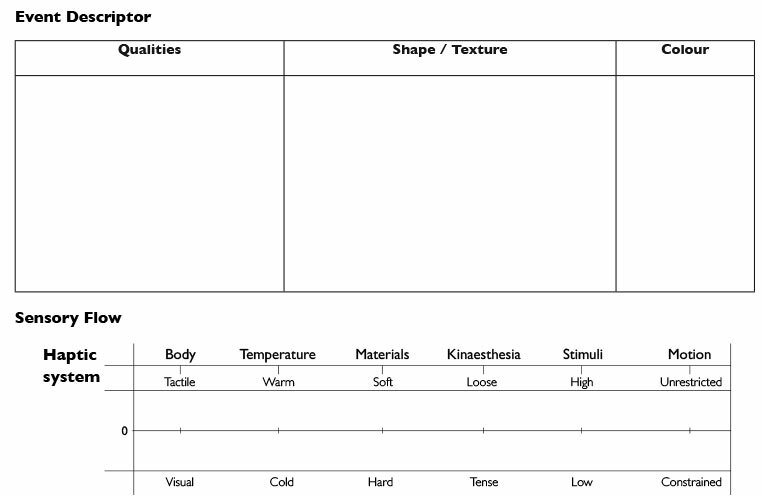 Complete the sensory flow diagrams. This will increase your familiarity with the site and you will start to develop more precise mental images. 03. 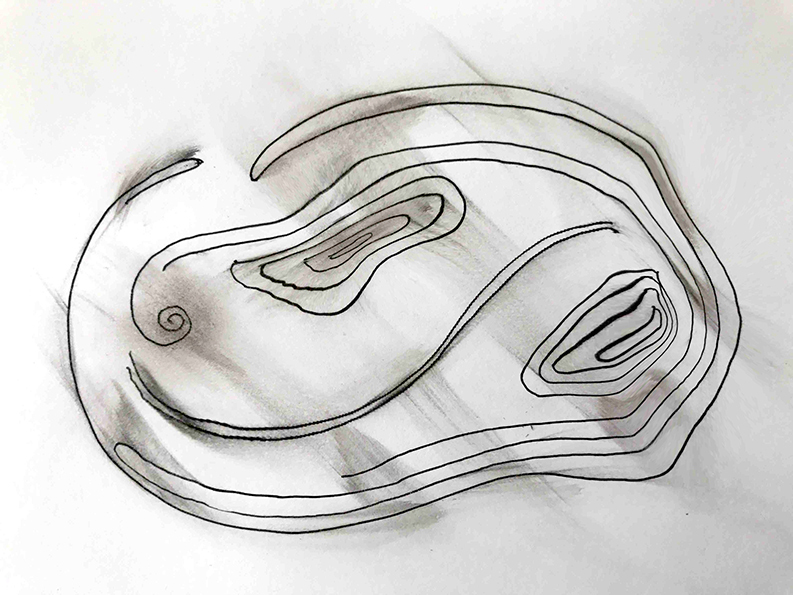 Document–Map sensory impressions using the 2D line drawing provided as an underlay. 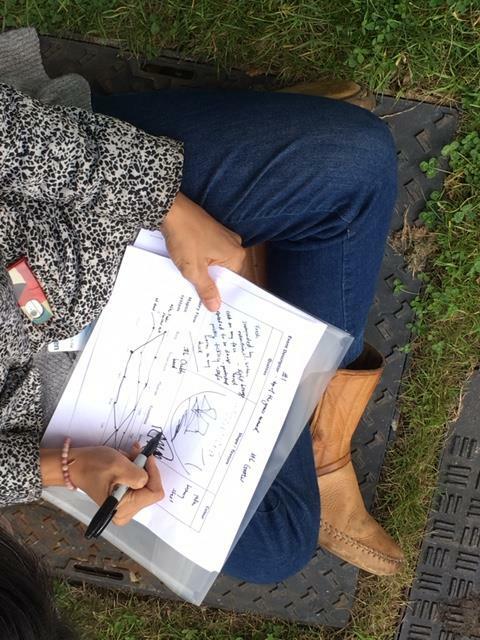 Place a sheet of tracing paper on top of the map and use symbols to record sensory impressions onto your map. 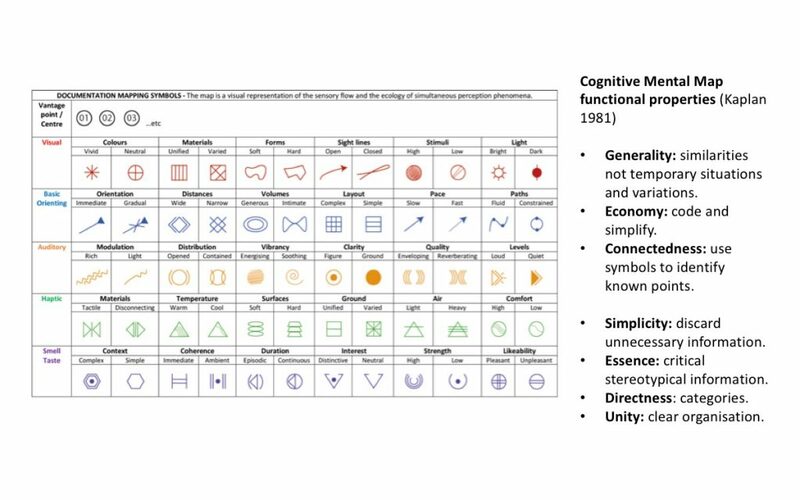 Use the symbols provided and include annotations if required. What do you see, smell/taste, hear, touch? How do you and others move through the site? 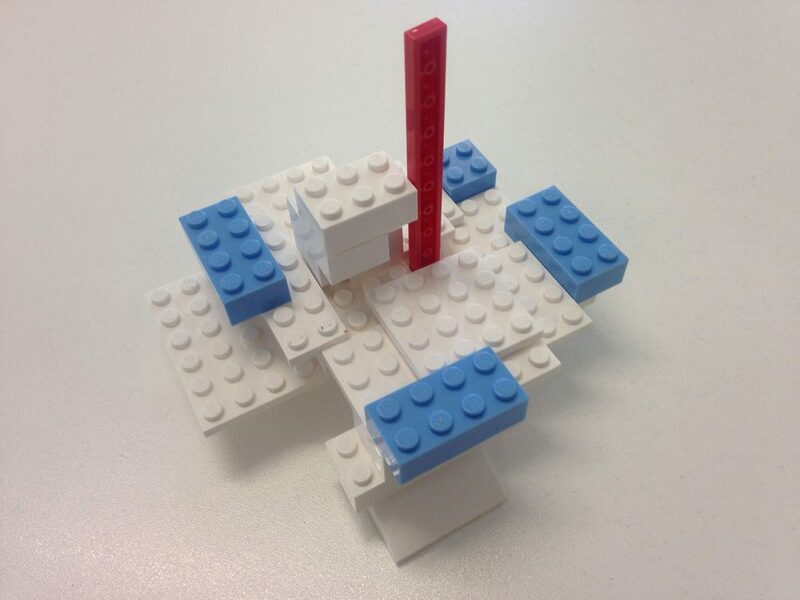 Can you identify perceptual thresholds and boundaries? Are there any sensemarks? Don’t try to document everything. Capture the essence of how the space resonates with your senses. Anheim, R. (1983) ‘Buildings as Percepts’, Via. 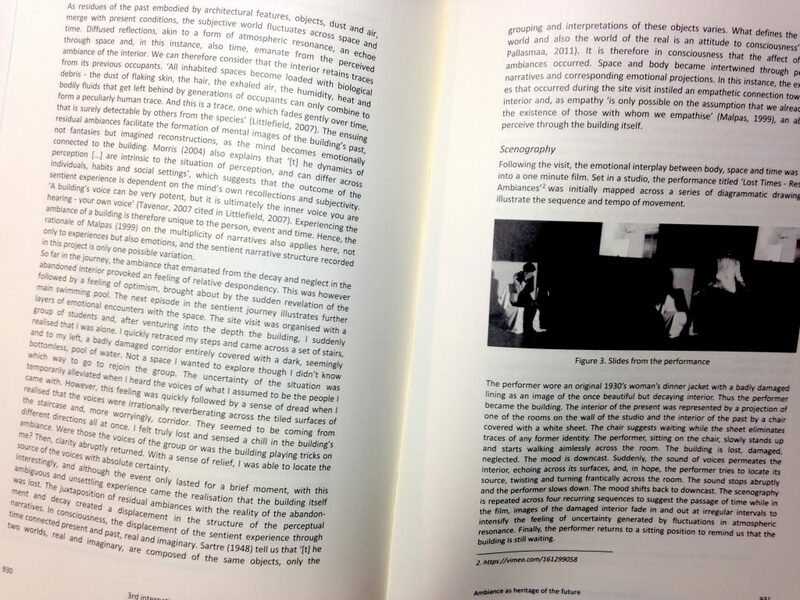 The Journal of the Graduate School of Fine Arts, Architecture and Visual Perception(6). Bachelard, G. (1958) The Poetics of Space., Boston: Beacon Press. 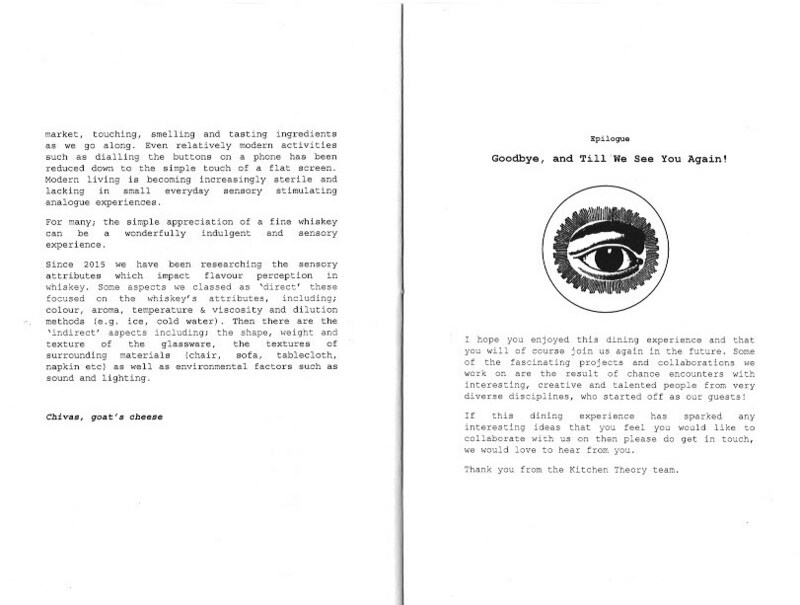 Gibson, J.J. (1966) The Senses Considered as Perceptual Systems, Boston: Houghton Mifflin. 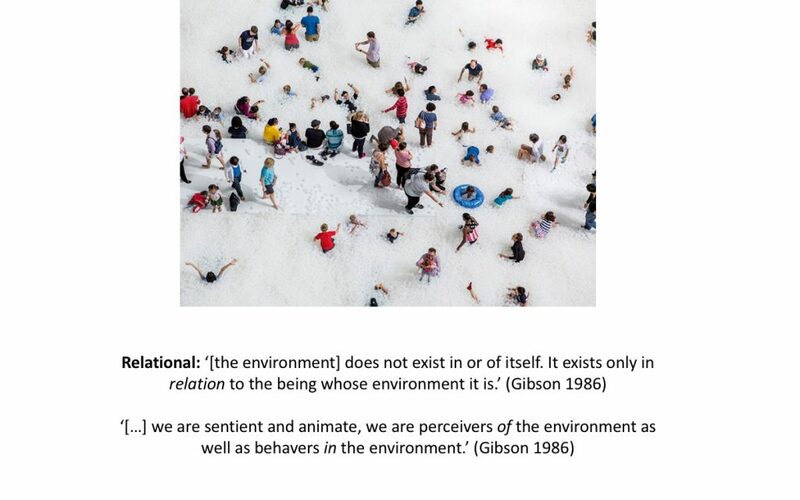 Gibson, J.J. (1986) The Ecological Approach to Visual Perception., Hove: Taylor & Francis Group. 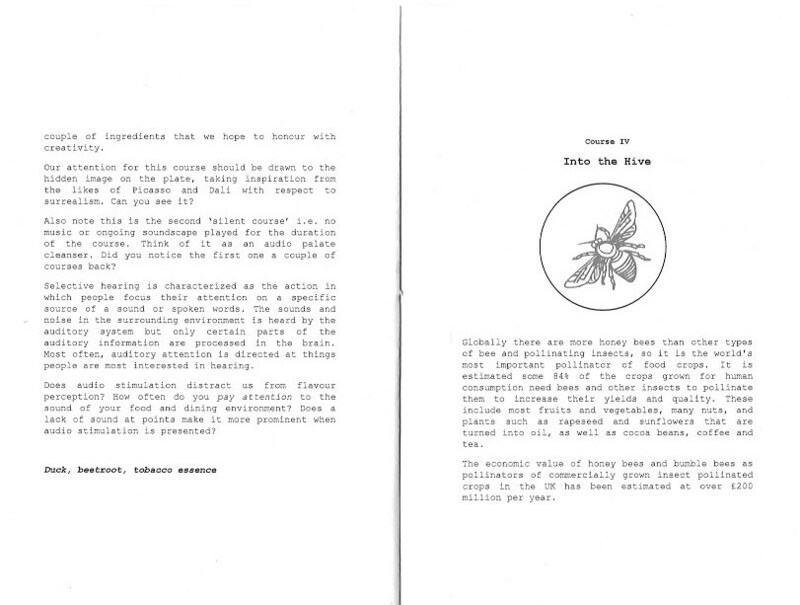 Hiss, T. (1990) The Experience of Place. A new way of looking and dealing with our radically changing cites and countryside., New York: Vintage Book. Johnson, M. (2007, 2008 ed.) The Meaning of the Body. Aesthetics of Human Understanding, Chicago & London: The University of Chicago Press. 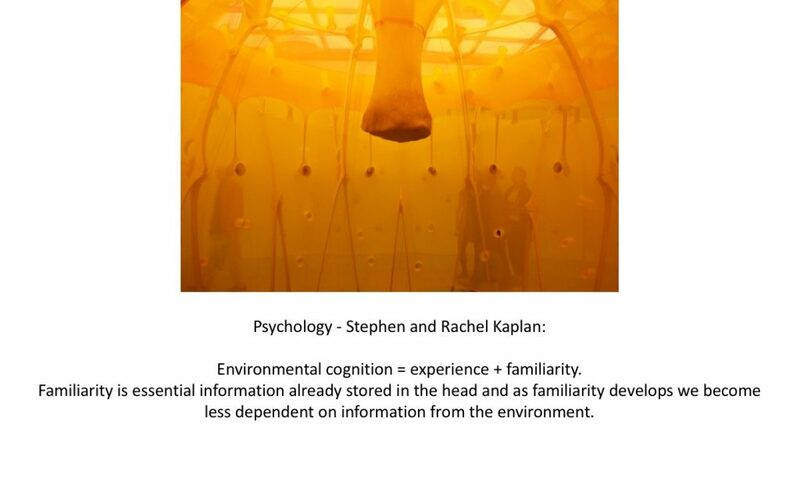 Kaplan, S. and Kaplan, R. (1981) Cognition and Environment: Functioning in an Uncertain World, Ann Arbor, Michigan: Ulrich’s Books. Lefebvre, H. (1991) The Production of Space, Oxford, England: Blackwell Publishing. Lynch, K. (1960) The Image of the City, Cambridge, Massachusetts and London, England: The M.I.T. Press. Mallgrave, H.F. (2011) The Architect’s Brain. 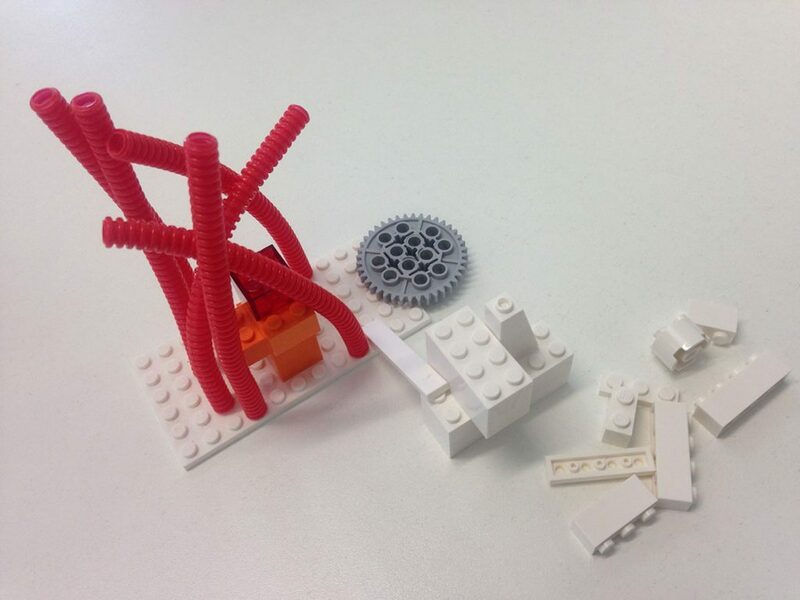 Neuroscience, Creativity and Architecture, Chichester, West Sussex: Wiley-Blackwell. Malnar, J.M. and Vodvarka, F. (1992) The Interior Dimension. 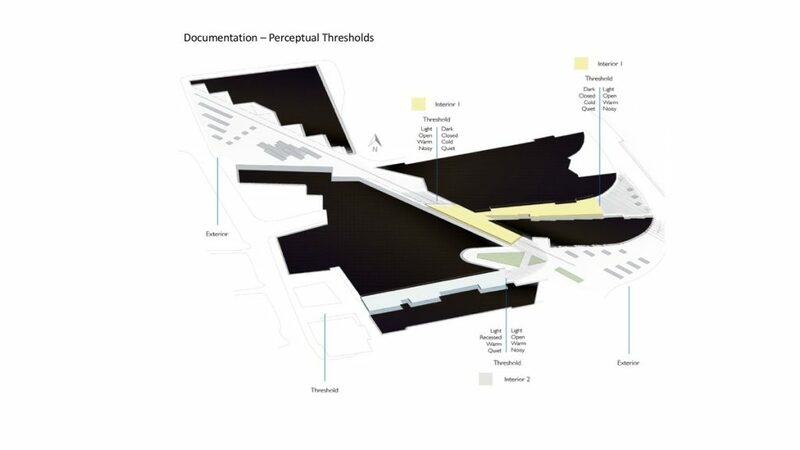 A Theoretical Approach to Enclosed Space., New York: John Wiley and Sons. Malnar, J.M. and Vodvarka, F. (2004) Sensory design, Minneapolis, Minn.: University of Minnesota Press. Merleau-Ponty, M. (1945. 2012 ed.) Phenomenology of Perception, London & New York: Routledge. Schmitz, H., Müllan, R. O. & Slaby, J. (2011) ‘Emotions outisde the box – the new phenomenology of feeling and corporeality’, Phenomenology and the Cognitive Sciences, 10(2), 241-259. On 16th June I participated in a seminar on multisensory design organised by CIBSE Intelligent Buildings Group & CIB W098 Commission on Intelligent & Responsive Buildings. The seminar took place at the architectural practice Feilden Clegg Bradley Studios in London. Our existence is enlivened every waking moment by a symphony of stimuli from people, objects, building spaces, task interest and Nature. This rich array of inputs to the mind and body generates the multi-sensory experience which can colour and enrich the environment for people to live and work in. Like in music the notes of melodies, harmonies and rhythms magically combine in a myriad ways to inspire the mind so too in multi-sensory design which weaves a tapestry and diversity of experience for people to flourish in. 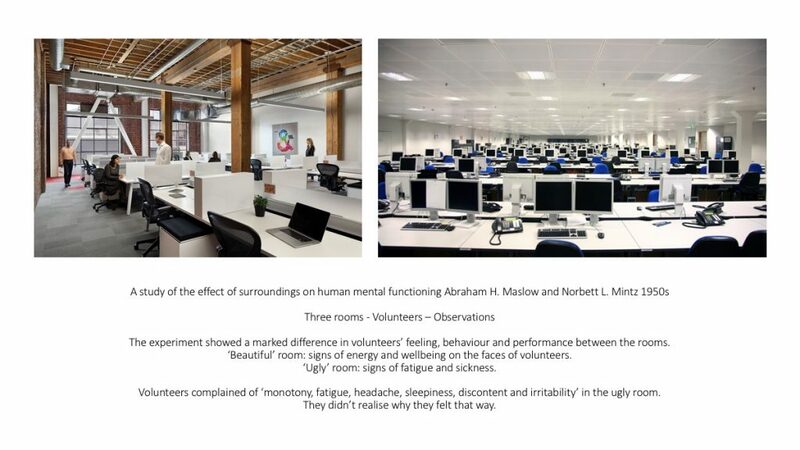 This seminar reviews the research but then shows how multisensory design can be achieved in practice to achieve healthy and wellbeing spaces. 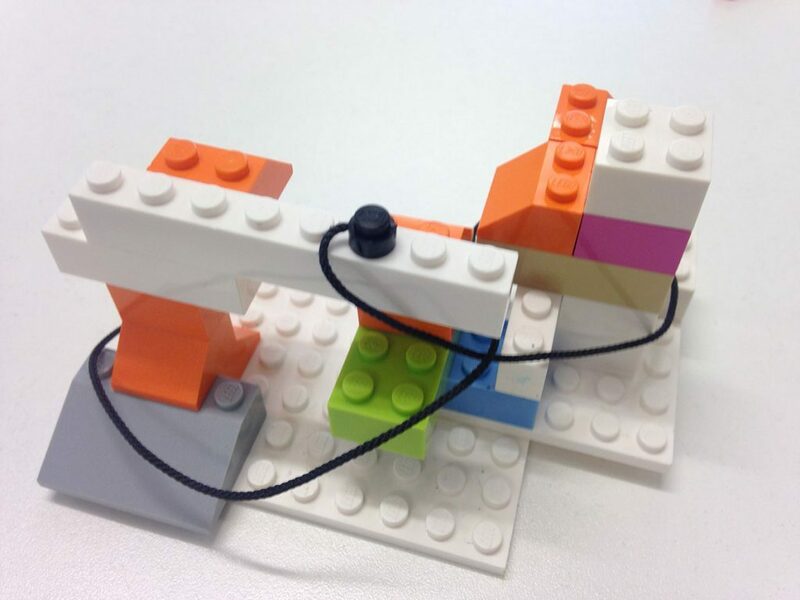 Valerie is a Senior Lecturer at University of the Arts London where she teaches interdisciplinary spatial practices. 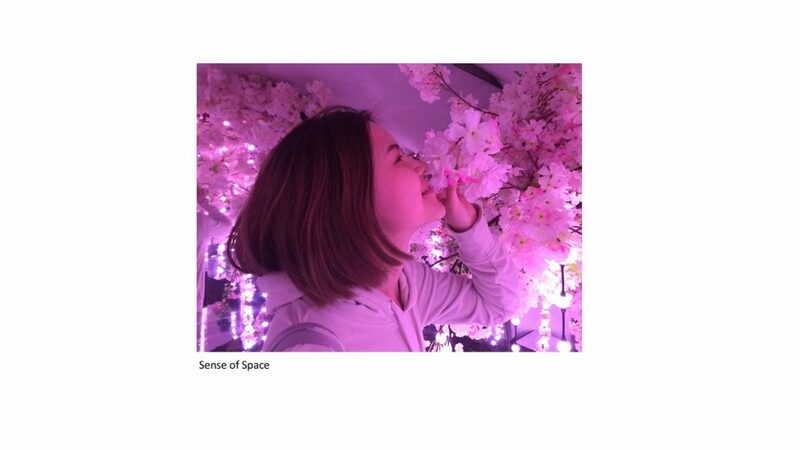 Her research centres on spatial experiences, sensing and atmospheres in interior and urban environments, developing sensory research methods and exploring practical applications for design. Carolina is a Lecturer at the new School of Architecture at the University of Reading. She teaches design studio, environmental design and technology. 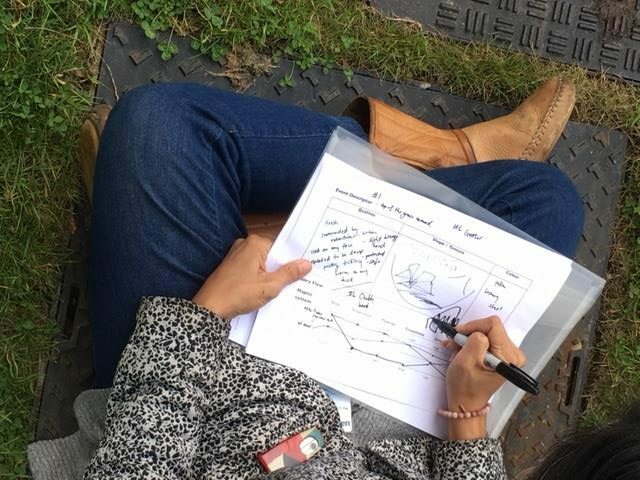 Her research focuses on the multisensory perception of public spaces, health and well-being in outdoor and indoor environments and community engagement, exploring interdisciplinary methodologies and design practices. Joe is a researcher within Feilden Clegg Bradley Studios, using a wide-range of tools to capture the impact of the built environment and feed-forward lessons to future projects. 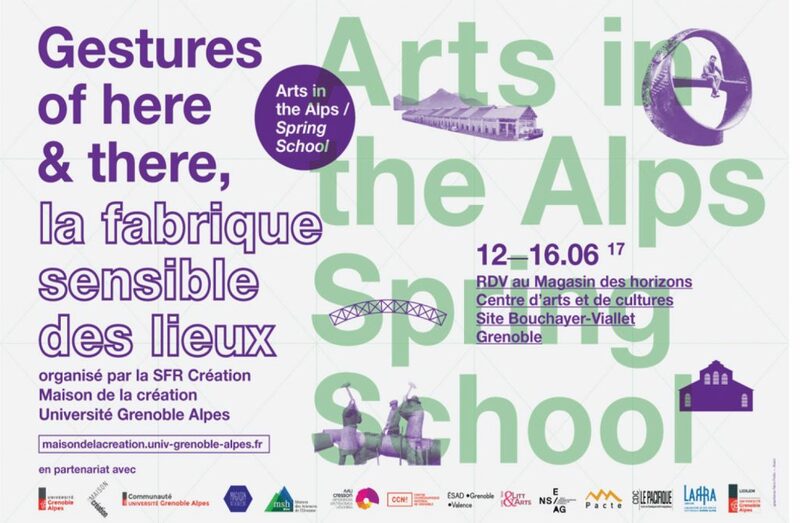 In 2017, I took part in Arts in the Alps, a week long doctoral research school organised by the Maison de la création at the Université Grenoble Alpes. The call for participation caught my attention because it related to my research interests while at the same time provided me with an opportunity to expand my practice and research network. My research and the topic of ongoing doctoral research centres on sensing and emotions in relation to wellbeing. This is informed by previous work, notably a project called Sensing the Urban Interior published in 2014. Following the principle of ‘spatial inversion’, whereby spaces between buildings habitually referred to as exteriors become interiors, I carried out a sensorial documentation of an urban interior, the More London Estate, a contemporary riverside business development in London. 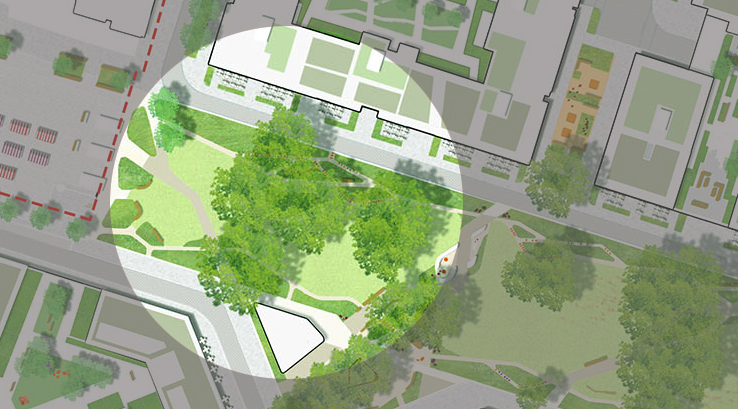 The location sits at the boundaries between inside and outside, private and public, enclosed and open space. This distinctive position and promise of interiority made it an ideal site of enquiry. The objective of the research was to uncover connections between the way we feel and our sense of belonging. 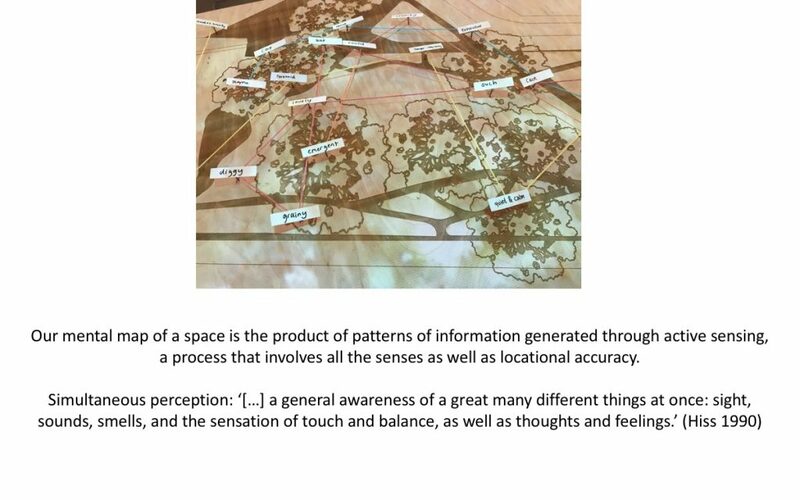 This was achieved by documenting how the urban interior resonated with the senses to provide a framework for reflection as well as an incentive towards sensory transformations. 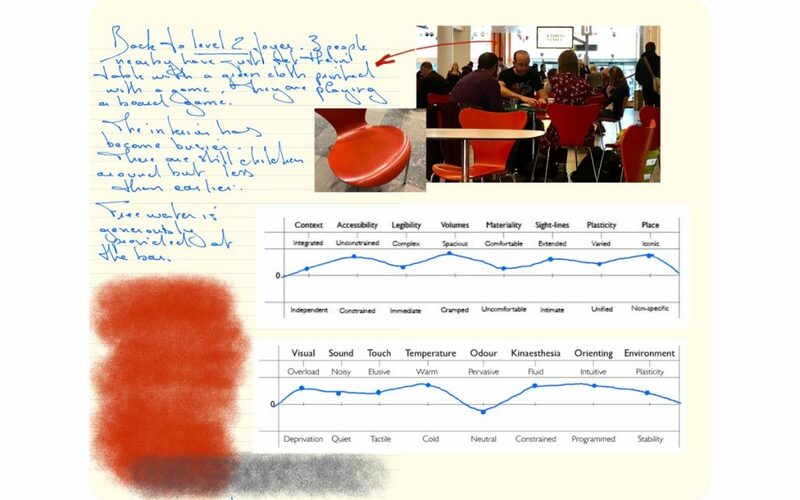 We use our senses to understand our environment, a form of data collection and processing that enables us to make sense of the world around us and, to find out why we feel the way we do about places and people within them, I develop sensory methods that enable me to document how we gather and process this data. My doctoral work relates phenomenology and ecology. Although the doctoral research is highly focussed I also believe that it is important to explore the wider context of the topic. For instance, as part of the Green Sky Thinking week of events, I recently attended a talk and demonstration by Atkins on digital technologies for urban environments and in June I am presenting the Sensory Flow, a documentation tool I developed in the Sensing the Urban Interior project, at a seminar on multi-sensory design organised by CIBSE Intelligent Buildings Group. 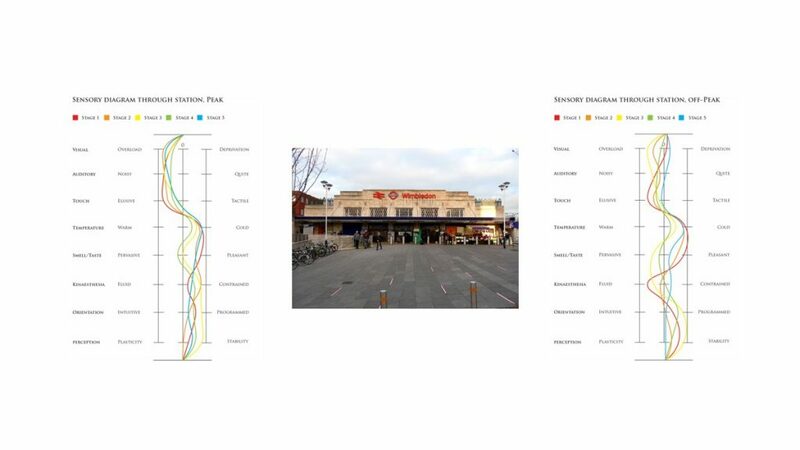 Prior to the start of my doctoral research, I also worked on a project called ‘Residual Ambiances – An Illustration of Urban Heritage as a Sentient Experience’. Our urban heritage incorporates many instances of abandoned buildings awaiting rescue, where residual fragments of past occupancies provide a stage for an immersive journey into the ambiance of the interior across past and present thresholds. Accordingly, this project illustrated a unique perceptual encounter between the abandoned interior of Poplar Baths in London and myself. Subsequently, I synthesised the emotion and intimacy of the sentient experience into a scenographic narrative and short performance. 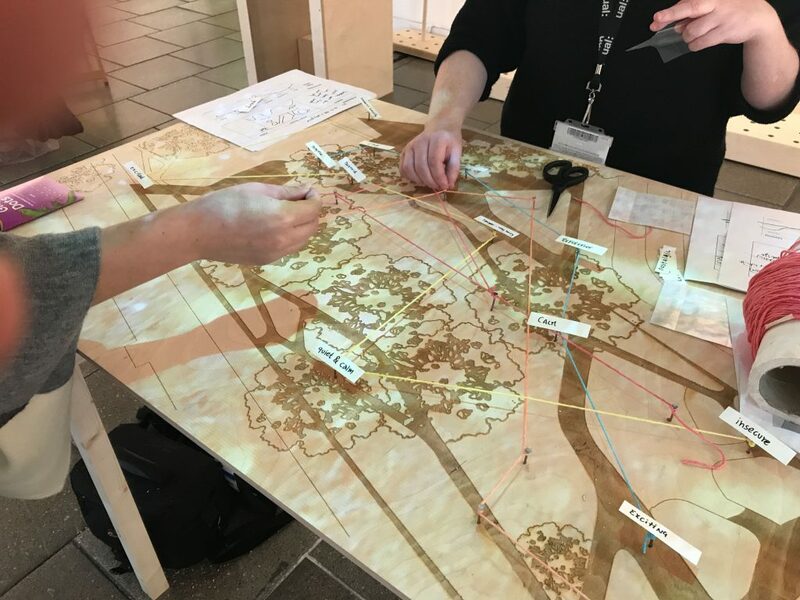 The interest of the project lied in its ability to articulate how sentient experiences activate a deep empathetic connection between body and space in the context of urban heritage. Following the completion of the project, I wrote a paper about it, which I presented at the 3rd International Congress on Ambiances in Volos, Greece, in September 2016. 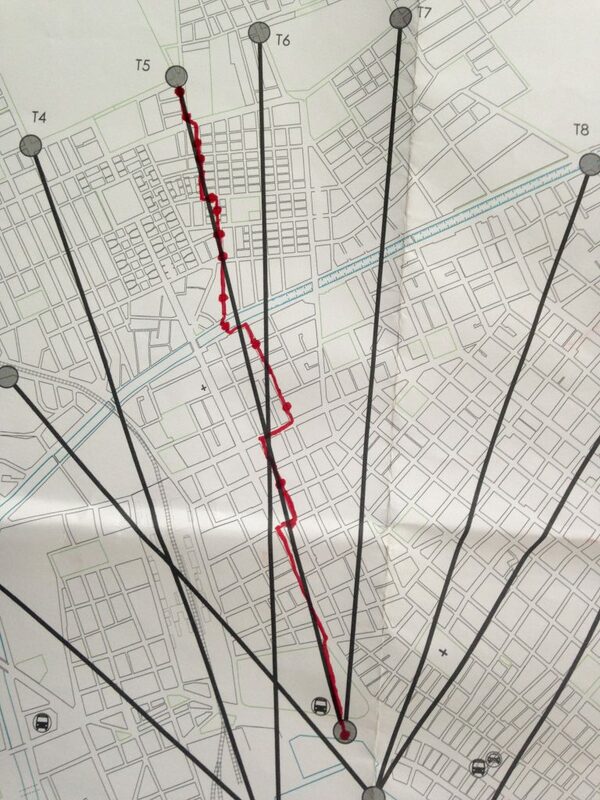 While there, I also took part in another activity called Volos Transects, a sensory mapping of the city. 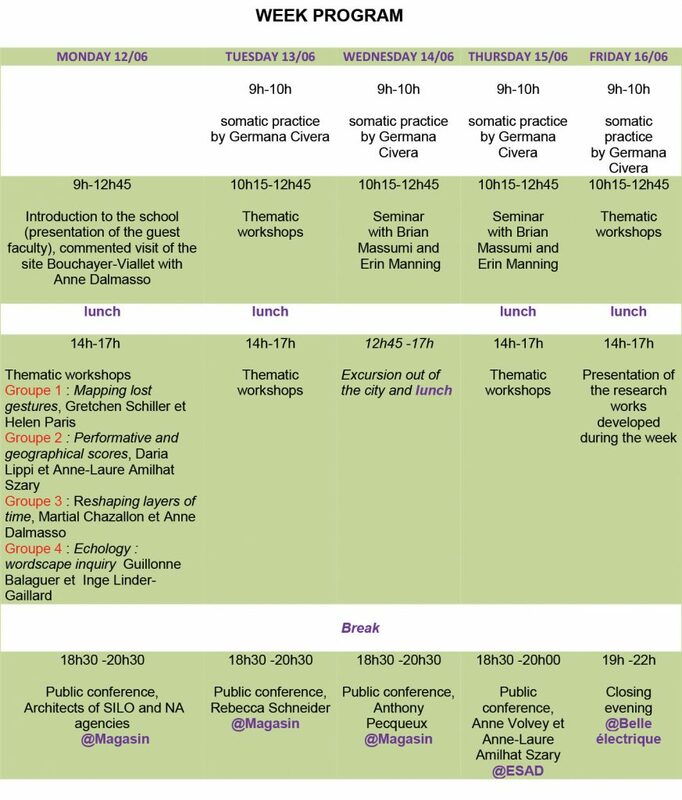 So, when the call for the Arts in the Alps research school came through, I saw this as an opportunity to further explore the wider context of my research, share knowledge and practices, participate, contribute and experiment within and international network of researchers and artists. “Gestures of here & there: la fabrique sensible des lieux”. 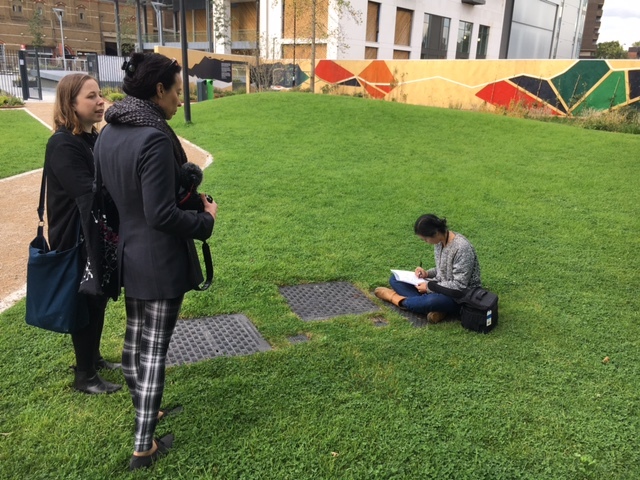 During the week participants had the opportunity to experiment, discuss and share interartistic and interdisciplinary practices of site specific research. 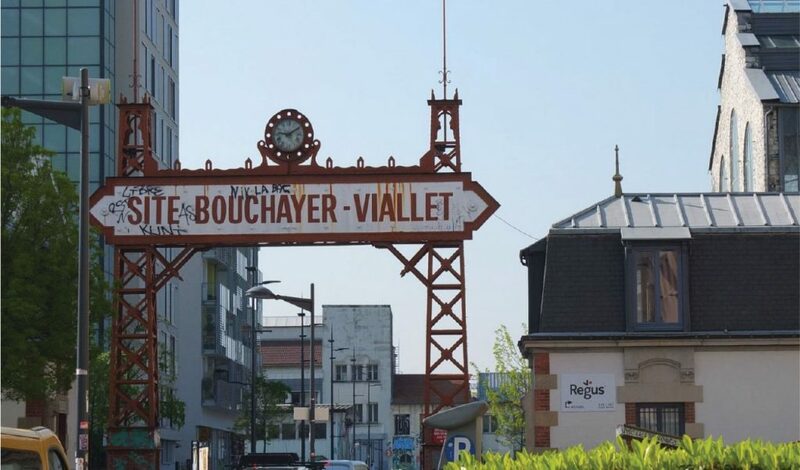 Specifically, centered on the question of the memory of a place, this research intensive week aimed at investigating the site of the Bouchayer-Viallet which has many historical layers: industrial, eco-cultural and artistic. This site held a strategic position in the hydroelectric sector in the early 1900s and is now reconverted as a development zone by the city of Grenoble. A nearly 3000m2 steel and glass factory building is now the home of Magasin les Horizons, a Center for Arts and Cultures which is where the school was based. 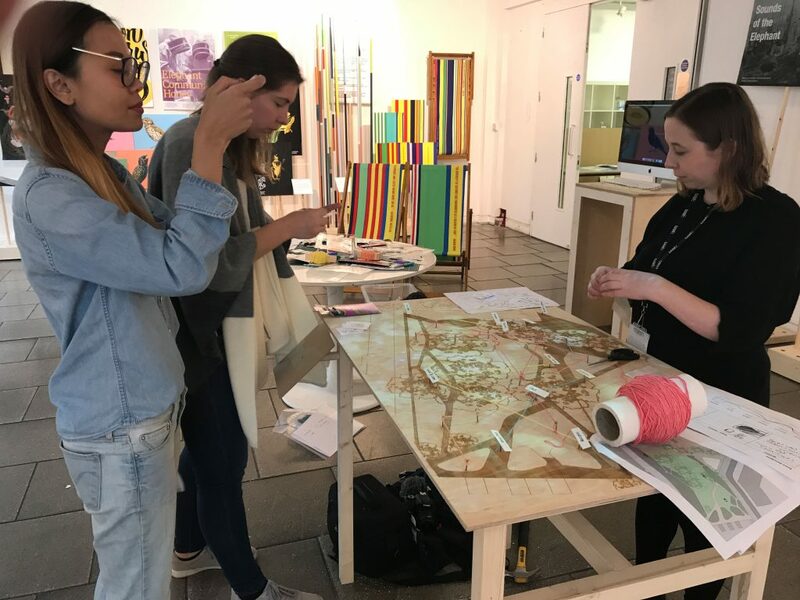 Throughout the five-day intensive doctoral school, participants had the opportunity to attend a series of workshops, seminars and events facilitated by an international group of researchers and artists. The mornings were dedicated to collective activities workshops, readings and seminars while the afternoon sessions focused on practice-based art and research platforms with smaller groups. 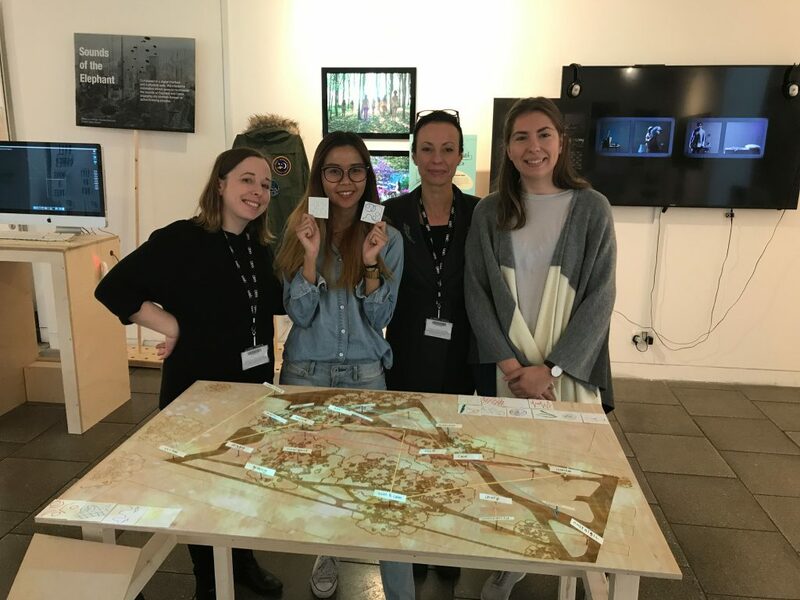 Participants were encouraged to experiment with sensory based research practices and to re-enact the collective and individual gestures which wove and continue to weave the multi-faceted identities of this historical site. Organizing committee: Gretchen Schiller (Maison de la Création & UMR LITT&ARTS, UGA), Nataliya Grulois et Anne-Claire Cauhapé (Maison de la Création, UGA), Claudine Moïse (LIDILEM, UGA), Anne-Laure Amilhat Szary (PACTE, UGA), Anne Dalmasso (LARHRA, UGA) Martin Givors (doctorant LITT&ARTS, UGA); Rachel Thomas (CRESSON, UMR 1563 AAU, ENSAG), Inge Linder-Gaillard (ÉSAD, École Supérieure d’Art et Design •Grenoble •Valence), Béatrice Josse et Camille Planeix ( Magasin des Horizons, Centre d’arts et de cultures), Marie Roche (Centre de développement chorégraphique Le Pacifique), Rachid Ouramdane et Erell Melscoet (CCN2, Centre chorégraphique national), Matthieu Warin (Maison des habitants de Bouchayer-Viallet). This was a complete departure from my usual ways of working. I tend to work alone when carrying out research or with participants. In the doctoral school, we worked in groups of 8 participants and there were 4 groups across the school in total, with 2 workshop leaders in each group. We also had a couple of people who worked in the school who came in and out of the sessions. People came from all over the world. In our group: UK, Canada, Belgium, Turkey, Australia, France, Spain who were artists, performers, academics, architects, philosophers. Each day started with a somatic practice organised by Germana Civera. Amazing! A most emotionally invigorating activity. Every day for 5 days, a great way to start the day. Then we would take part in thematic workshops and there were also two seminars with Erin Maning and philosopher Brian Massumi. The day would end with a conference. We started the day at 9am and finished at 8:30pm. Everyone would then meet for dinner into a restaurant booked by our organisers, a different place each day. We ended the week in a beautiful guest house in the woods outside Grenoble for a celebration and final goodbyes. 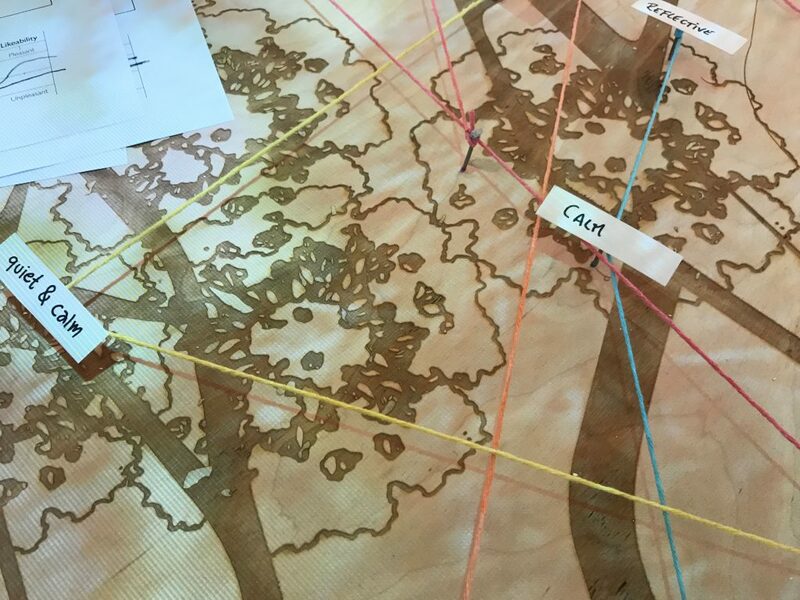 The theme for my group was Mapping Lost Gestures and the workshops were run by Gretchen Schiller and Helen Paris, both a pleasure to work with. They made everyone feel welcome and very soon, it became clear that we had excellent group dynamics where everyone was happy to participate, and no one was making judgements on others. In the thematic workshops, we were required to mostly express ourselves through bodily gestures. It felt very awkward for me at first because I didn’t know what I was doing but I soon learnt from observing others more familiar with performance and by day two, I became more attuned to bodily gestures, and by day three it felt like a completely natural way of communicating. All the activities we took part in in the first 4 days were designed to help us prepare a 40 minutes performance to present to the other groups and tutors on the last day. The group worked incredibly well and we were all able to make a contribution and enjoy ourselves in the process. This week -long research school was the most uplifting research event I have been to. People connected in a very positive way. There was a degree of freedom and an ability for us to take some ownership of what we did which means that we achieved a lot and it was also a pleasure to do it. The organisers recently sent us the link to a website where they posted filmed interviews of the people talking about the activities they organised. Watching the films brought back very fond memories. Although I haven’t had the opportunity to apply performance to my research since I started by doctorate, my work is about embodied experiences, including bodily movement and gestures, so there may be opportunities in the future to integrate performance led experimental interventions into my practice. Attiwill, S. (2011). Urban and Interior: techniques for an urban interiorist. In R. U. Hinkel, (Ed. 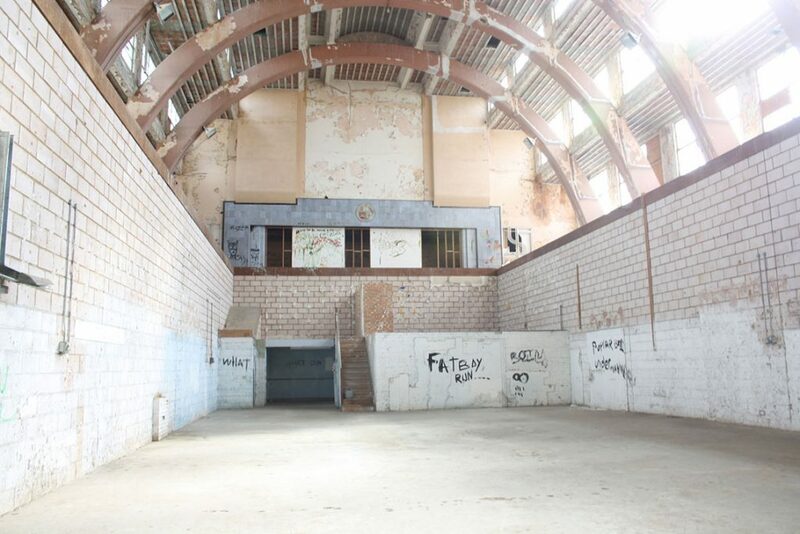 ), Urban Interior – informal explorations, interventions and occupations (pp. 12-24). School of Architecture and Desing, RMIT University, Melbourne, Australia. Baunach: Spurbuchverlag. We make sense of the world through our senses. We are sentient beings and that as such, experiences are inevitably multi-sensory. 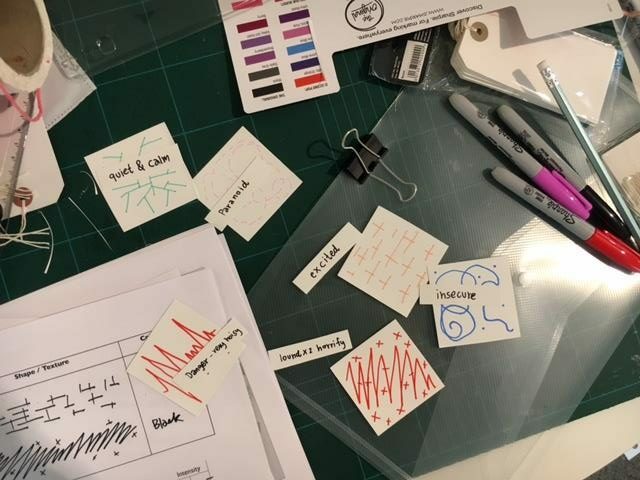 This exploratory workshop invites participants to discover ways to document and map sensory perceptions and learn how designers develop their knowledge of sensing and their sensitivity to the sensory world to perfect sensory intelligent designs. 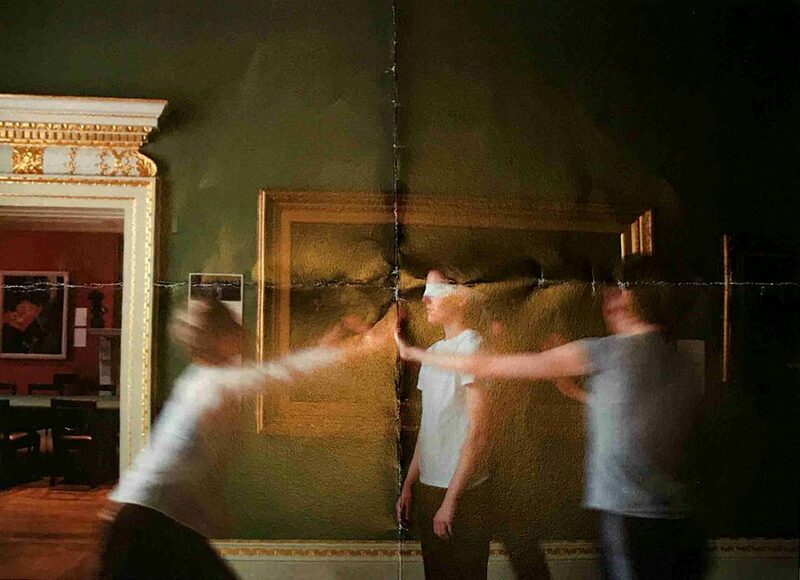 The movements of the body enable us to engage with the world through a process of intimate connections and interactions with spaces, people and objects. Environmental psychologist James. J. Gibson (198)3) calls it active sensing. Passive sense organs pick up on energy in the environment. 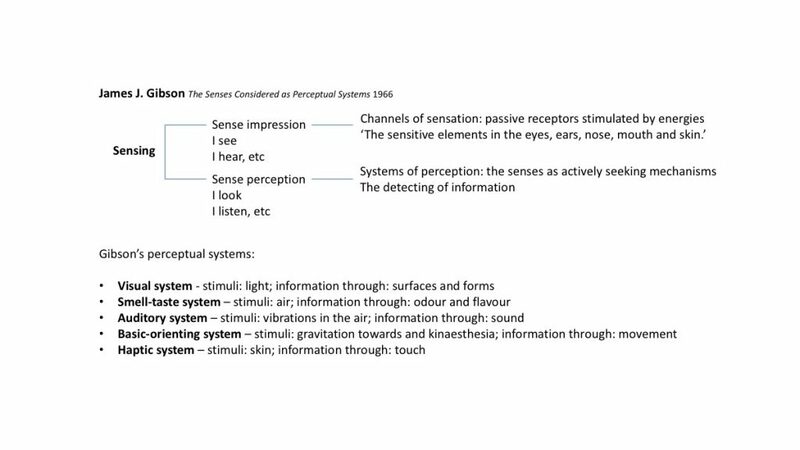 Active perceptual systems (Gibson 1966) – visual, haptic, smell/taste, auditory, basic orienting. – seek information in the environment by constantly moving (eyes, head, body). Active sensing occurs in motion. 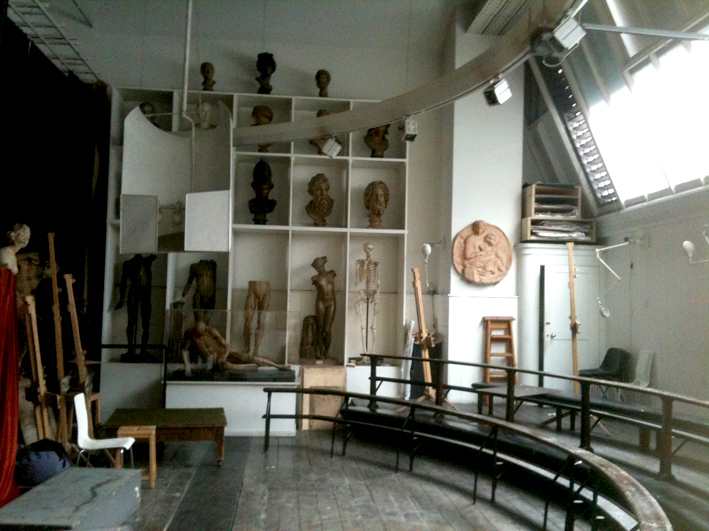 The workshop begins with a short briefing session in the Lower Street gallery at London College of Communication. 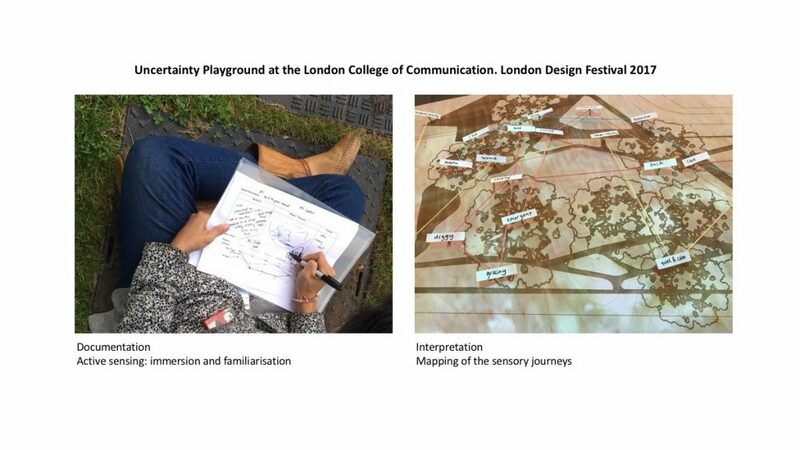 Participants are then invited to explore Elephant Park, a nearby green urban space, and bring back their findings to LCC where they are given the opportunity to translate these finding into a sensory map of their experience. You are invited to explore sensory experiences in Elephant Park. In your journey through the park you will stop at six different points, including your start and end point. Each time you stop, mark the point on your map and record your experience using one of the documentation handout provided. Also indicate on the map the proximity of the source of the sensory experience. Using your phone, take photographs, films, sound recordings of your sensory experiences. You will be assigned a starting point. You goal is to reach a diagonally opposite point of your choice. Allow your sensory curiosity and perceptions to guide you. You don’t need to walk in a straight line. You can move across following a curved or zig-zag path to explore different points of interest in your journey. We encourage you to be experimental. Don’t just walk on the paths or edges, find interesting places such as placing yourself under a tree or even hugging a tree, lying on the grass or bench, looking up, down, through, into, etc. There’s no right or wrong, only your sensory perceptions as they occur. 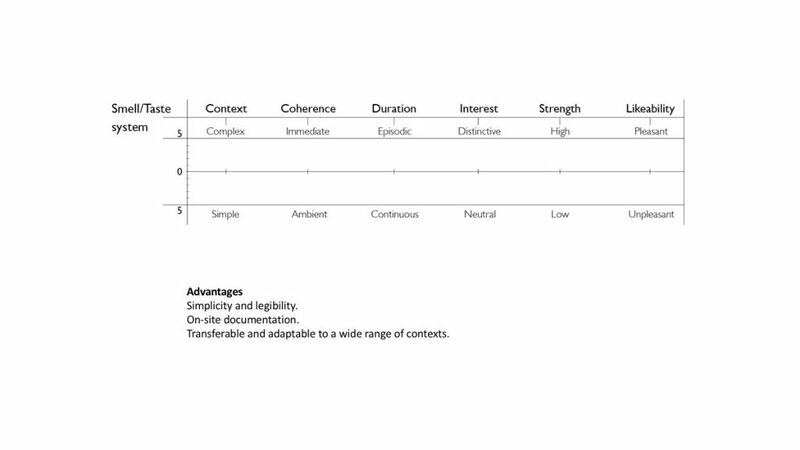 In the Event Descriptor, write down adjectives that best represent the qualities of each sensory experience, then draw a shape or a series/cluster of shapes, with textures if relevant, that you associate with the experience. Next write down the name of the colour you associate with the experience. Don’t spend too much time thinking about the experience. Record immediate, visceral impressions as they occur. We experience a flow of information as we move through the environment. Johnson (2007) calls it a ‘streaming-past’ flow. 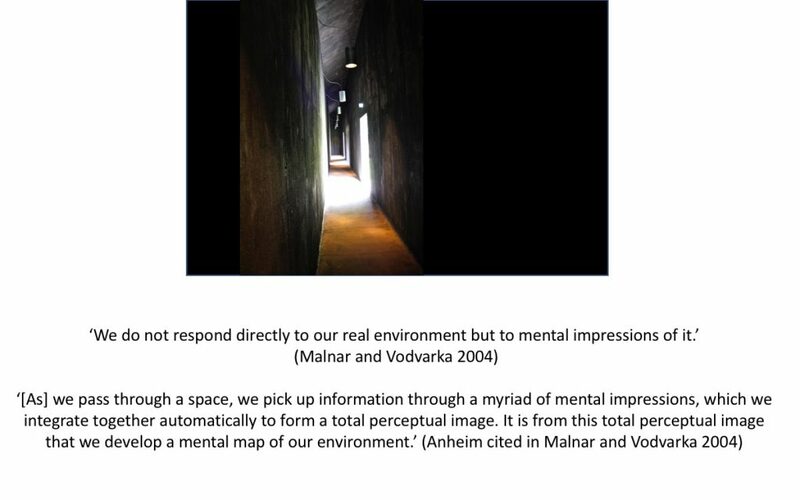 ‘[…] if you are moving forward in a linear fashion, you experience a visual ‘flow’ that emerges from a horizontal focal point in front of you, expands out from that point and streams towards you, and then envelops and flows past you.’ (Johnson (2007: 50). Not all sensory perceptions flow in the same way. For example, sounds and smells reach us and we move through them. In the Sensory Flow diagram, place a dot to indicate the characteristic of the sensory experience. 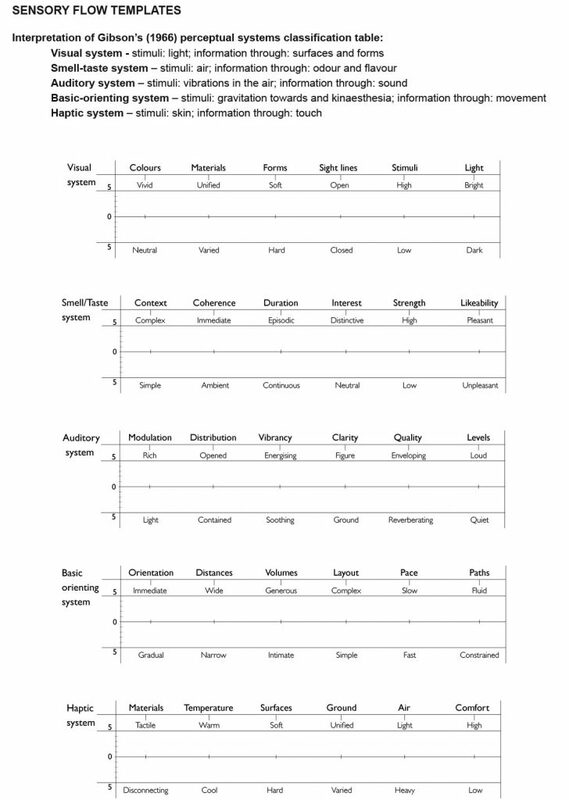 Below is an example of what the completed sensory flow diagrams looks like although your template will be different. Gibson, J. J. 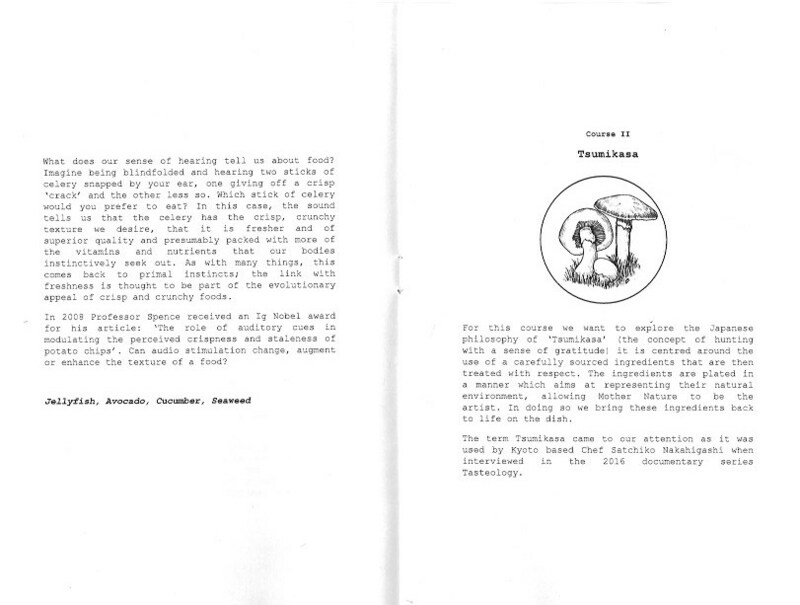 (1966) The Senses Considered as Perceptual Systems. Boston: Houghton Mifflin. Gibson, J. J. 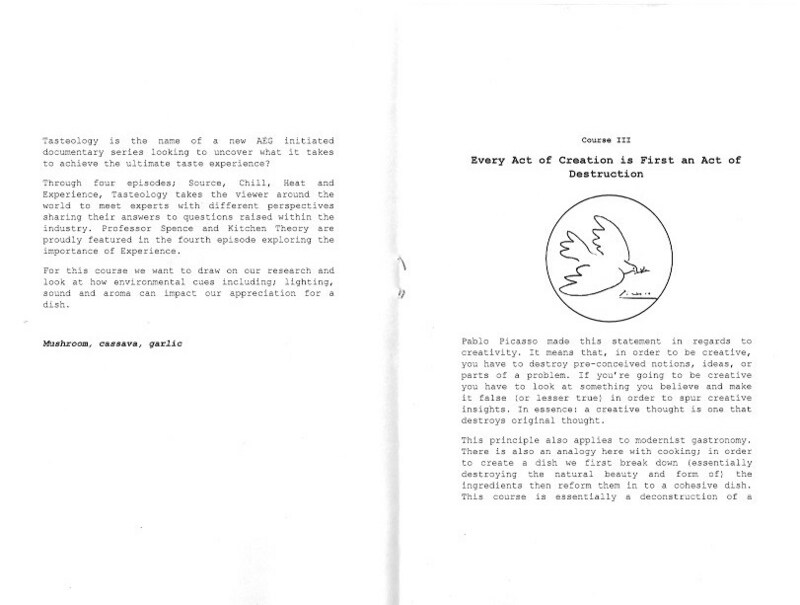 (1986) The Ecological Approach to Visual Perception. Hove: Taylor & Francis Group. Johnson, M. (2007, 2008 ed.) The Meaning of the Body. Aesthetics of Human Understanding. Chicago & London: The University of Chicago Press. 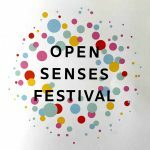 The London Open Senses Festival ran from 19-21 May 2017. 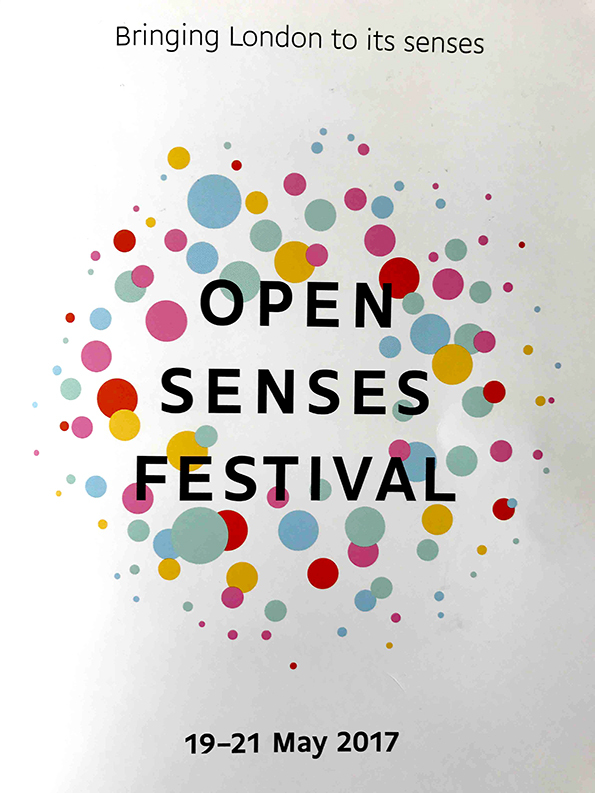 The first of its kind, first of many I hope, the festival included an rich mix of sensory events and experiences, and a symposium at the University of London. The symposium included many excellent presentations and workshops while the most pertinent to my research was a presentation by architect Juhani Pallasmaa. 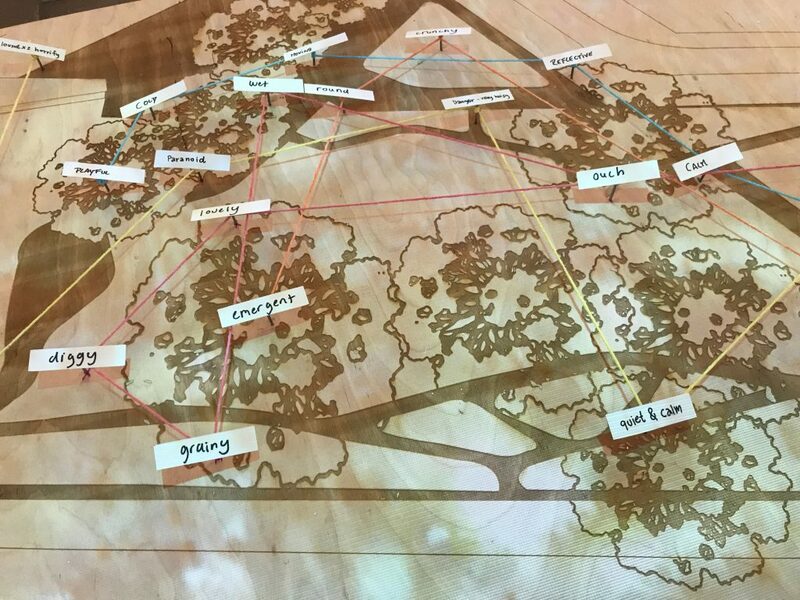 Titled Landscape of the Senses – Touching the World, the presentation explored the hegemony of vision in our culture and in architecture. 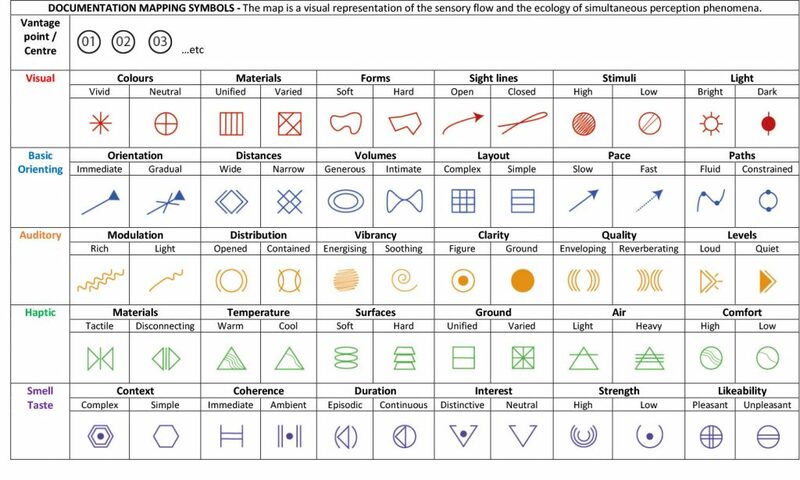 The senses are often regarded as independent systems but they are in fact integrated as part of our embodied condition. Philosopher Gaston Bachelard (1958) speaks of the polyphony of the senses. In life, sensory stimuli don’t occur in isolation and embodied sensory experiences are essential to our wellbeing. If we remove ourselves from bodily sensory experiences we live impoverished lives. Therefore, we need an integrated approach in research and design. Pallasmaa also spoke about the shallow appropriation of the sensory realm in marketing strategies. This sensory manipulation of the senses leads to hyperesthesia (or hyperaesthesia), a condition that involves an abnormal increase in sensitivity to stimuli of the senses. According to Pallasmaa, we are in an era of branded manipulations, of total anesthetisation. The essence of architecture and its social significance are being replaced by a formal aesthetic rhetoric and an uncritical view of digital technologies further detaches us from sensory experiences. Unfortunately, Pallasmaa didn’t have time to elaborate on these statements and explain what he means by the essence of architecture. Further reading into his many books and papers will surely enlighten the topic. However, I agree that many contemporary buildings and urban spaces lack social significance. Does the rise in interest in the senses across so many disciplines points to a societal malaise? Perhaps, as Pallasmaa points out, in a digitally enhance world, people have become starved of meaningful embodied experiences. On the other hand there are interesting new possibilities emerging through technologies. In the morning of the symposium, I visited Thresholds by Matt Collishaw in Somerset House (not part of the festival). 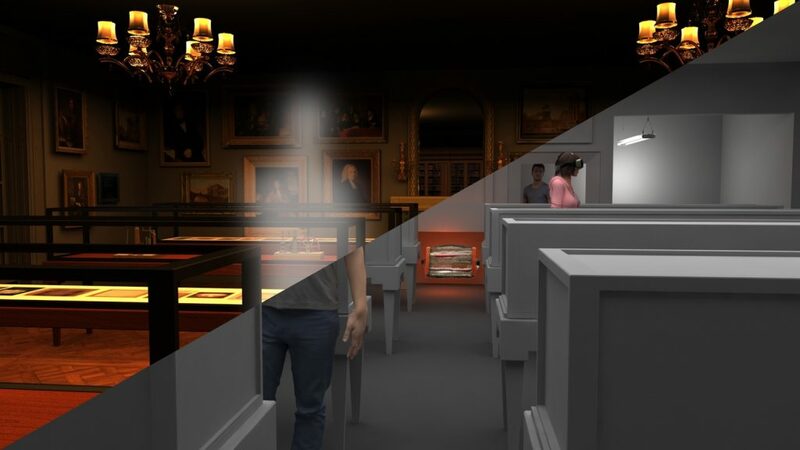 Thresholds is an immersive installation that uses the latest VR technology. It reproduces the interior of King Edward’s school in Birmingham to take us back to 1839, to an early exhibition of photography by British scientist William Henry Fox Talbot. As in all VR experiences, I wore a headset but this time, I also had a unit strapped to my back. Initially the experience felt artificial, like being in a game, and intriguing at the same time. As my mind adapted to the environment details emerged and the VR space began to resonate with my senses. I could touch the wood of the photography display cases. Mice occasionally running across the room, insect flying around the chandeliers, and a fire burning in the fireplace, animated the space. I could feel the warmth of the fire but I didn’t have the same confidence moving my hands towards it as I would in real life. Perhaps because I couldn’t see my own hand, only an orange glow. My sense of depth and movement functioned as expected but I still needed time to adapt the the virtual environment. After a while, I could also hear the noise of a crowd coming from outside the room. I believe it was meant to be a riot though I never felt the tension the same situation would cause in reality. This was staged and the experience was short lived (six minutes). Nonetheless, the scenographic use of technology was amazing. 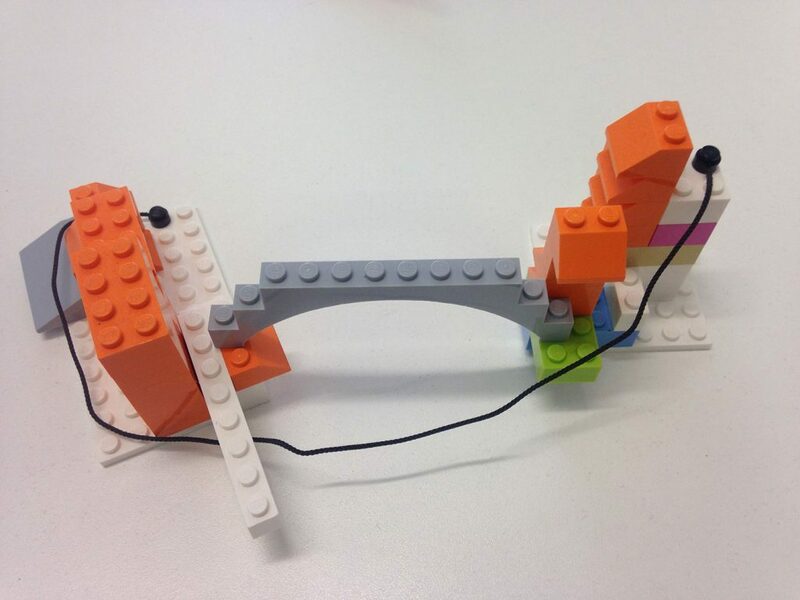 It also illustrates possibilities for integrating sensory experiences into a virtual space. The experiment would have failed if it had only focused on the visual. Frieze magazine commented that ‘Collishaw has not recreated an historical experience, but has instead constructed an entirely new one.’ Matt Collishaw is an amazing artists who challenges perceptions and expectations. The ocular-centric paradigm occupies a prominent place in Pallasmaa’s critique of architecture. 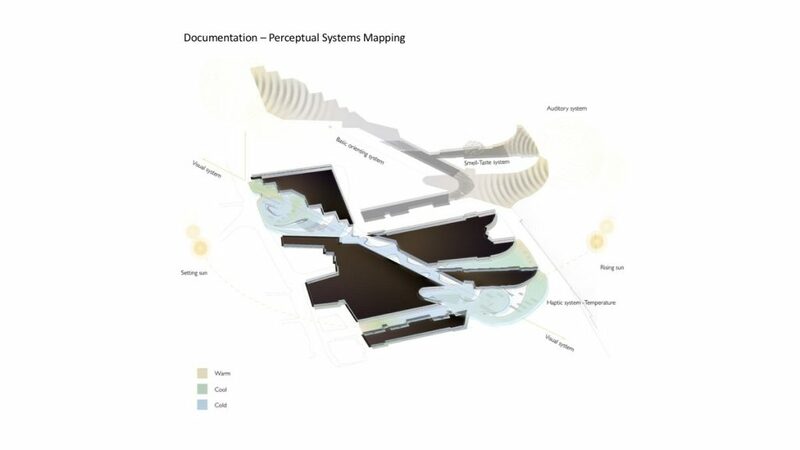 He argues that the role of the senses and the impact of the way spaces resonate with our senses is largely overlooked in architectural practices because of the use of an ocular centric language of symbols and images. He is not the only one to expound a a multi-sensory approach to architecture and design. 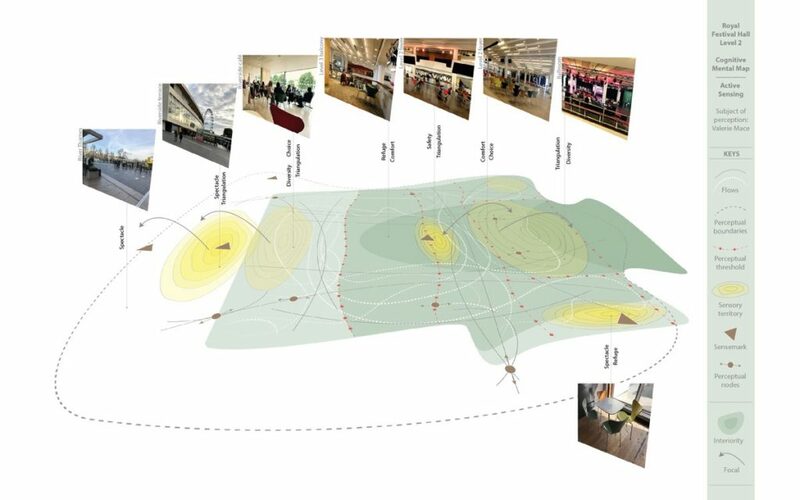 Architect Joy-Monice Malnar and artist Frank Vodvarka (2004) also tell us that ‘sensory data are rarely central to design decisions’ and interior designer Sashi Caan (2011) identified that practice-led research in this area lacks rigour. I also include myself in this school of thought. 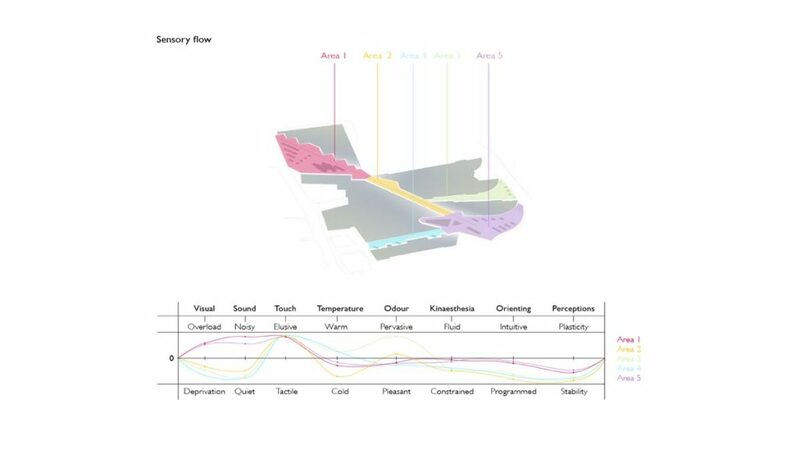 In my research , I aim to enrich our knowledge of embodied sensory experiences through the study of atmospheric qualities and user relations in spaces, and promote a multi-sensory (integrated) approach to spatial design practices. Visual culture dominates but vision is a sense of distance. We don’t need to be close to something to see it and this can create a distance between body and space. Pallasmaa may have been thinking about the work of theorist Henry Lefebvre (1974) when he spoke out against the prevailing ocular centric paradigm. In The Production of Space, Lefebvre explains that ‘[the image] detaches the pure form from its impure content – from lived time, everyday time, and from bodies with their opacity and solidity, their warmth, their life and their death’. 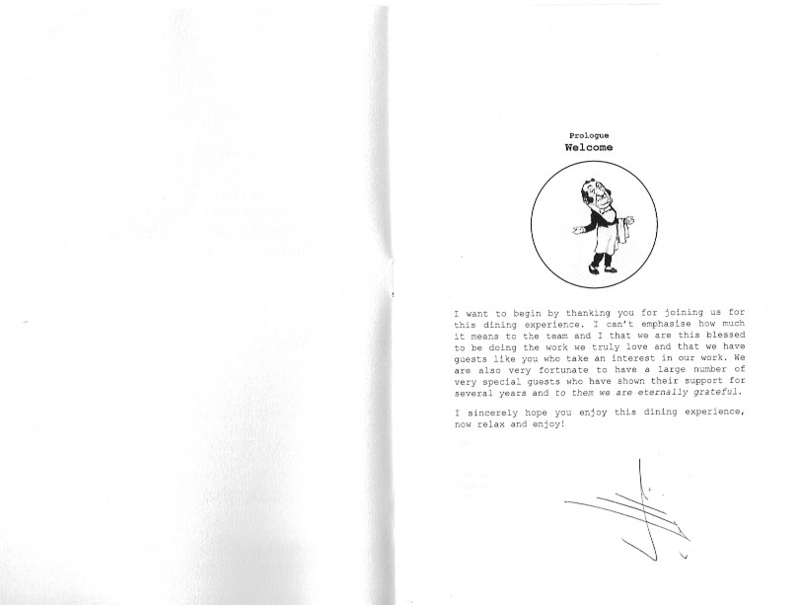 Lefebvre takes and uncompromising position when he says that ‘[…] the image kills’. 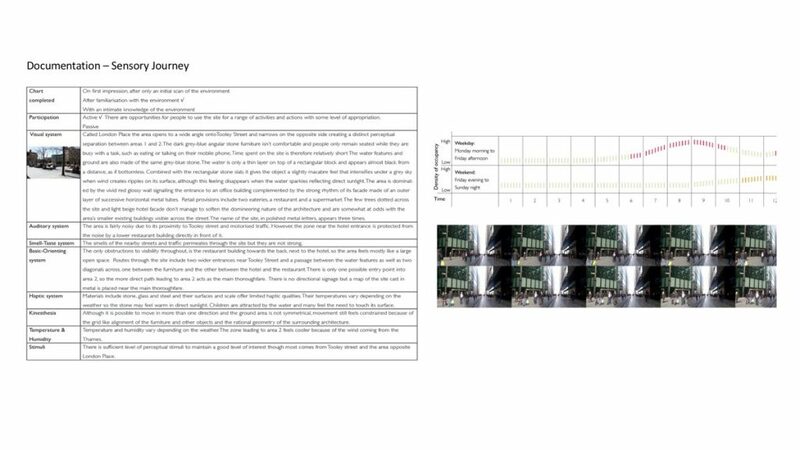 I wouldn’t go as far but I agree with Pallasmaa who says that ‘it is […] important to survey critically the role of vision in relation to the other senses in our understanding and practice of the art of architecture’. As Caan explains, ‘[d]esign is the deliberate intervention in our environment to ameliorate the conditions of our existence’. We can’t achieve this if we rely mostly on the visual sense when designing. Therefore, we need to encourage a multi-sensory mind-set in spatial design practices to enrich our experiences of everyday spaces. Bachelard, G. (1958, 1994 ed.) The Poetics of Space. Lefebvre, H. (1974, 1991 ed.) The Production of Space. Oxford, England:Blackwell Publishing. 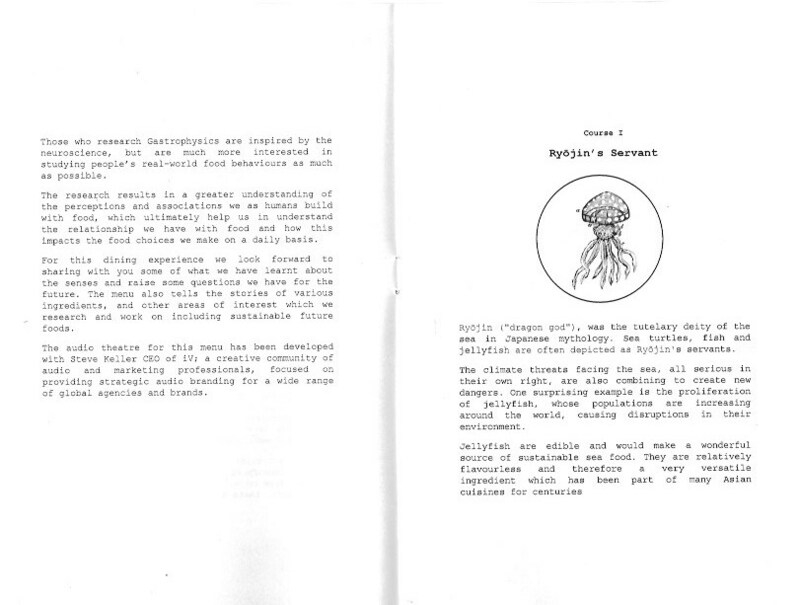 Malnar, Joy MoniceVodvarka, Frank (2004) Sensory design. Minneapolis,Minn. : University of Minnesota Press. Pallasmaa, J. (2005) The Eyes of the Skin. Architecture and the Senses. New York: John Wiley & Sons. Umwelten is a site-specific performance at the Royal Academy by Juri Nishi in collaboration with Bitter Suite. Blindfolded I was led into the space of the performance where three performers choreographed their movements with mine and choreographed my movements with theirs as I was led on a sensorial journey through the room. It was the most wonderful experience. At no point did it feel unsafe or awkward. I became completely immersed into the performance and completely relaxed, becoming malleable to the choreography. My Umwelten became a fluid space unconstrained by traditional architectural principles. The Umwelt, located in the fairly new field of sensory ecology, is a theory developed by ethologist Jacob von Uexküll. The events’ flyer describes sensory ecology as the study of how organisms acquire, process and respond to information from the environment, exchanging materials, energies and sensory information. Von Uexküll studied how animals behave in relation to their environment and theorised that the qualities of an environment are not intrinsic to the environment but depend on the way the mind interprets the world. Therefore, organisms can have different Umwelten even in the same environments. This is an interesting theory because it articulates that qualities in the environment are subject dependent and that the mind and the world are inseparable. The theory of Umwelt recognises the complexity of the phenomenal environment as perceived and interpreted by the subject of perception. Although I was blindfolded, I completely surrendered to the fluid environment created by the performance. I was told it lasted 20 minutes, it felt like barely 10 had passed. At the end of the performance, I was given a pad and pencil to draw my impression of the space as it emerged in my imagination. Still under the spell of the performance I drew a symbolic mental map that illustrates a fluid journey, in parts lacking definition in a space removed from architectural conventions. When the performance ended, I felt very light, almost floating, and this continued for a long time afterwards, until I took the tube to the next event I was attending that day. My London Underground umwelten brought me back to reality. Buchanan, B. (2009) Onto-Ethologies. The Animal Environments of Uexkull, Heidegger, Merleau-Ponty, and Deleuze. Humans with a Theory of Meaning. 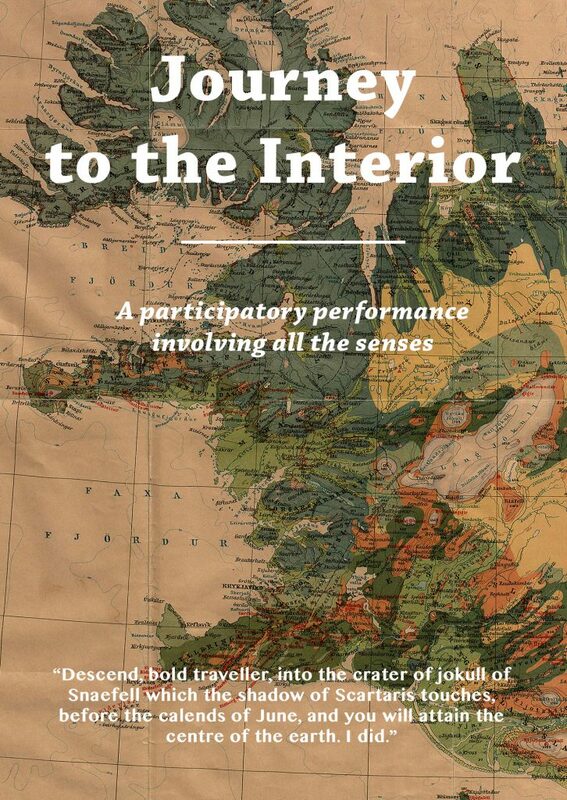 This event is described as ‘a multi-sensory, participatory performance and a feast, inspired by George Bellas Grenough, a geologist and founder of the Geological Society, London as well as Jules Verne’s story the Journey to the Centre of the Earth’. Artistic Director, Tereza Stehlikova and her team, created an impressive array of sensory experiences around the topics of geology and journey to the centre of the earth. 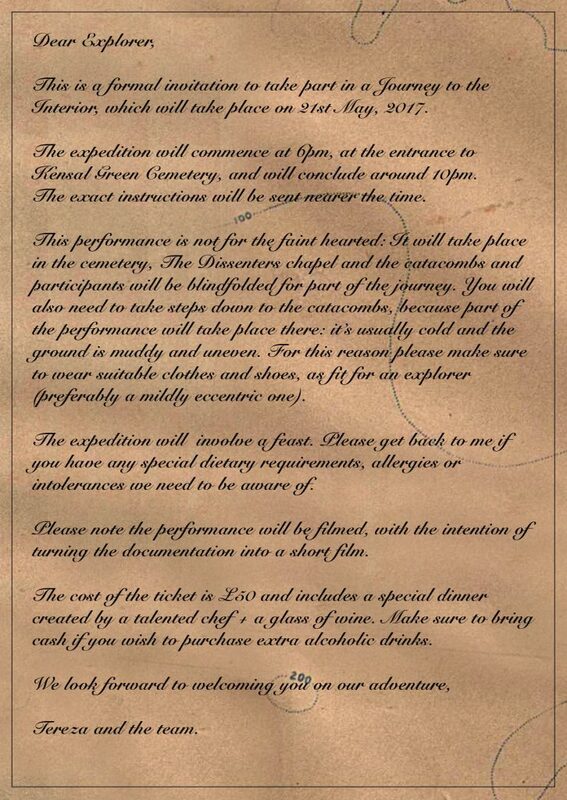 The journey began in Kensal Green cemetery all the way through to the core of the earth, through to carbon art by Mateusz Gidaszewski, sugar metamorphics by Ellie Doney, and ended with an amazing meal designed and prepared to enrich our experience of the themes chosen for this event. The food was intriguing, enticing and delicious. The company was excellent. This paper is based on a project I carried out while a student on the MA Interior Design at the University of Westminster and the site visit this account relates to was initiated by the Course Leader, Dusan Decermic, whose inspiring vision, constructive comments and persistence gave me the confidence and commitment to push the boundaries of my knowledge and abilities. Abstract. Our urban heritage incorporates many instances of abandoned buildings awaiting rescue, where residual fragments of past occupancies provide a stage for an immersive journey into the ambiance of the interior across past and present thresholds. 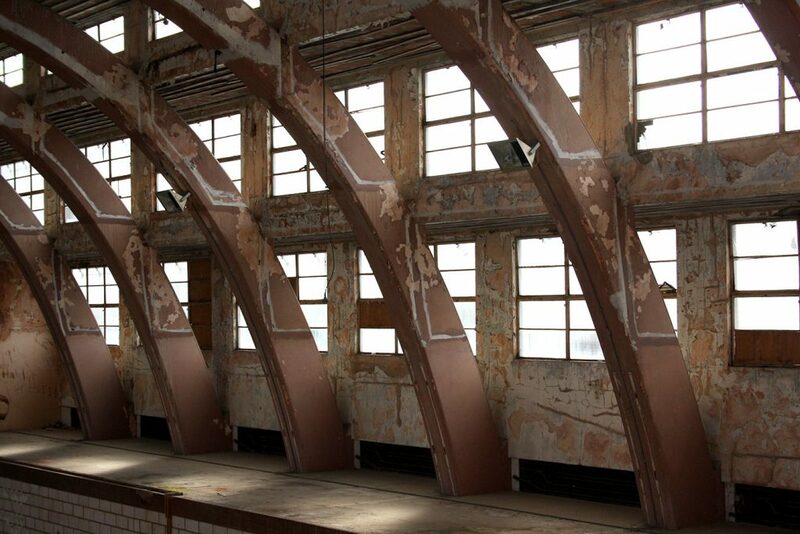 Accordingly, this project illustrates a unique perceptual encounter between the abandoned interior of Poplar Baths in London and the author, while subsequently, the emotive affect of the sentient experience is synthesised into a performed scenographic narrative. 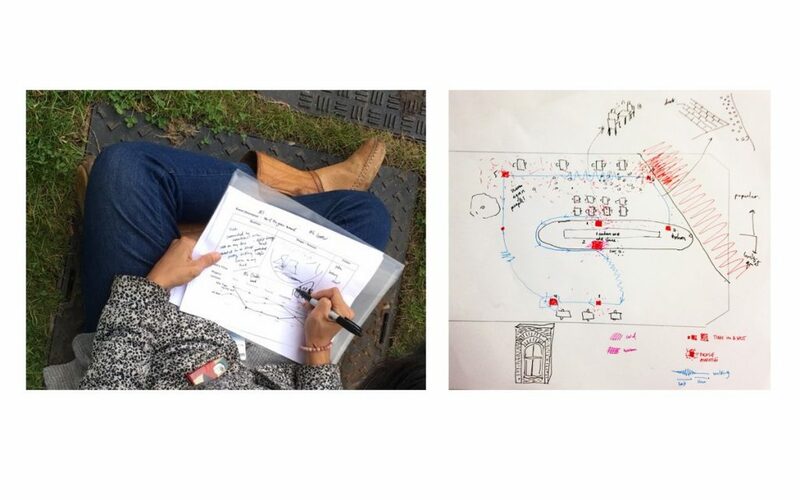 The interest of the project lies in its ability to articulate how sentient experiences activate a deep empathetic connection between body and space in the context of urban heritage. The project also includes a short performance available from vimeo. The film of the performance was shown at the congress while simultaneously playing on a loop at an exhibition of staff research work at the London College of Communication (LCC) as part of the London Design Festival and LCC’s public programme. 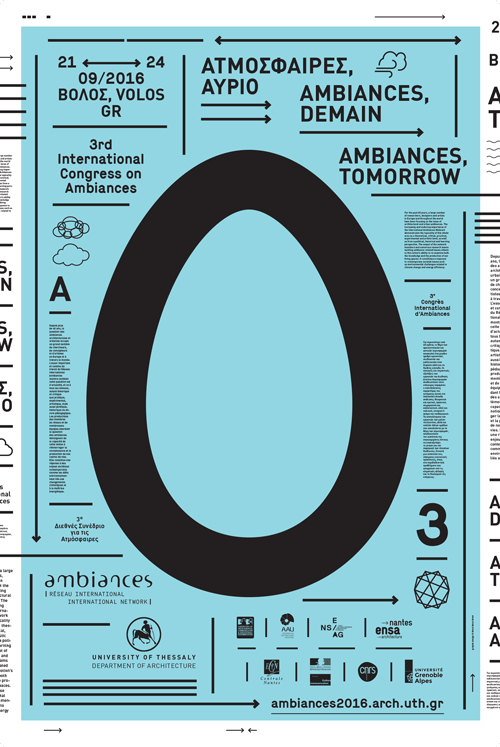 I recently attended Ambiances, tomorrow, the 3rd International Congress on Ambiances organised in Volos, Greece: 21 – 24 September 2016 by the International Ambiances Network. 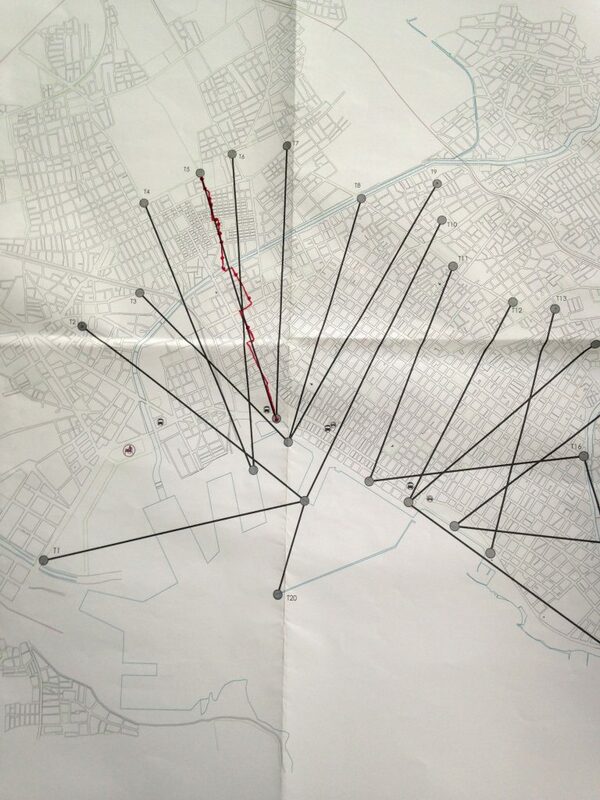 Aside from a rich array of presentations, the congress included workshops and events, notably the Transects workshop, where teams of 4 researchers were invited to document a pre-selected route across Volos. Detailed information about the workshop is available on the congress’s website. I worked with 3 other people (from Spain and Denmark) documenting route 5. Each of us had a specific role and mine was the cartographer. A fun and enjoyable experience, a great way to get to know people and a city. Above: Map showing all routes. 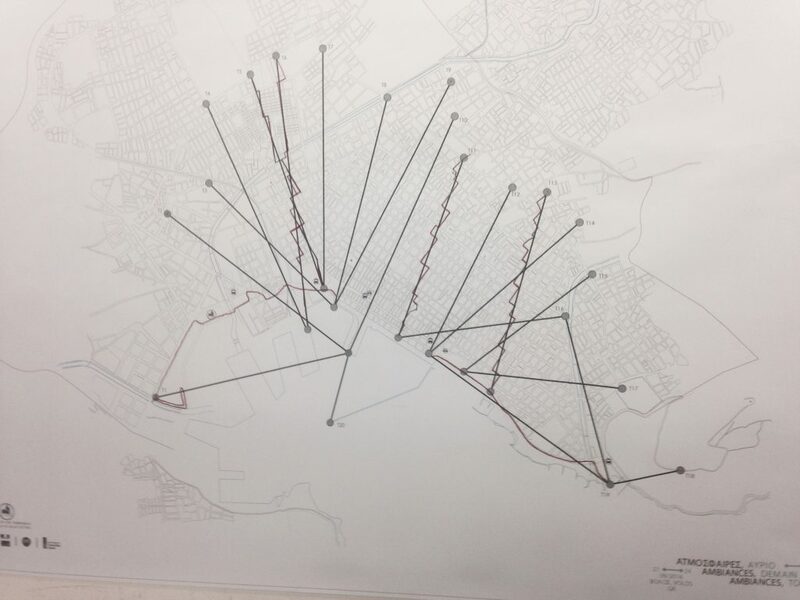 The black lines show pre-selected routes and the red ones the paths taken by the research teams. The objective was to remains as close as possible to the pre-selected route. 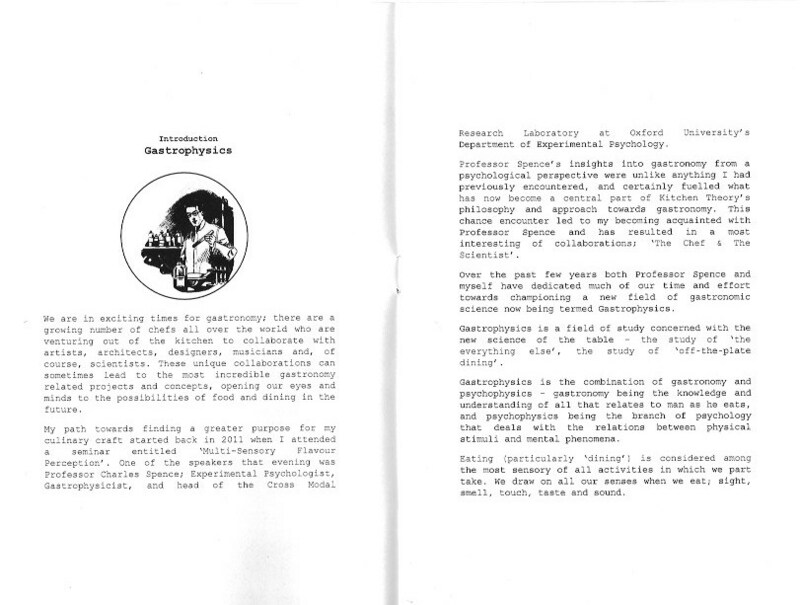 A paper I wrote as an account of a phenomenological experience. It is published in the 2015 Urban + Interior edition of the IDEA journal. Available for download from the IDEA website. The paper also includes location photographs I took to illustrate the phenomenological journey. 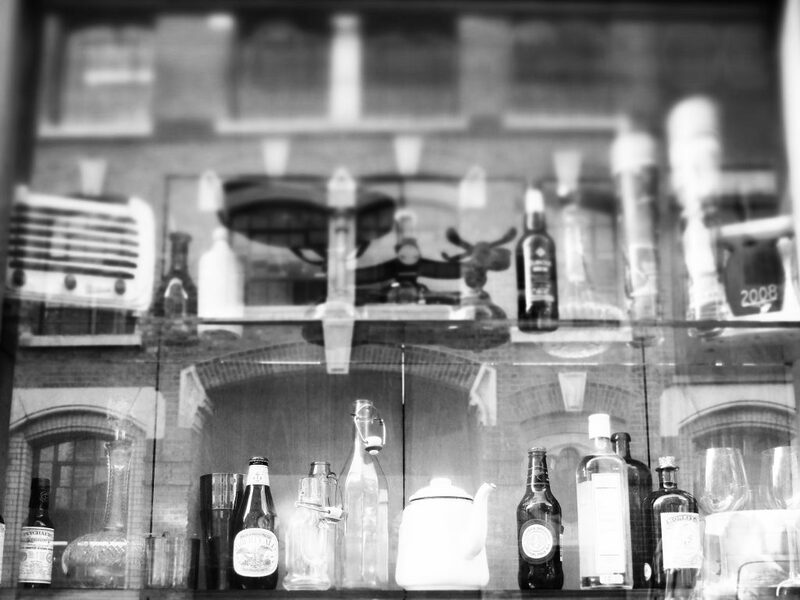 This paper reconsiders a refurbished London street, Bermondsey Street, as an interior where objects of memories are curated into a reconstructed atmosphere of domesticity. The study argues that as our experience of the city becomes increasingly transient, the notion of inhabiting shifts to a wider and more fragmented context, and our ability to integrate with the urban environment becomes eroded. Bermondsey Street, however, presents a distinctive experience where the phenomena of intimacy and familiarity converge across space and time to provide a more stable form of inhabitation. 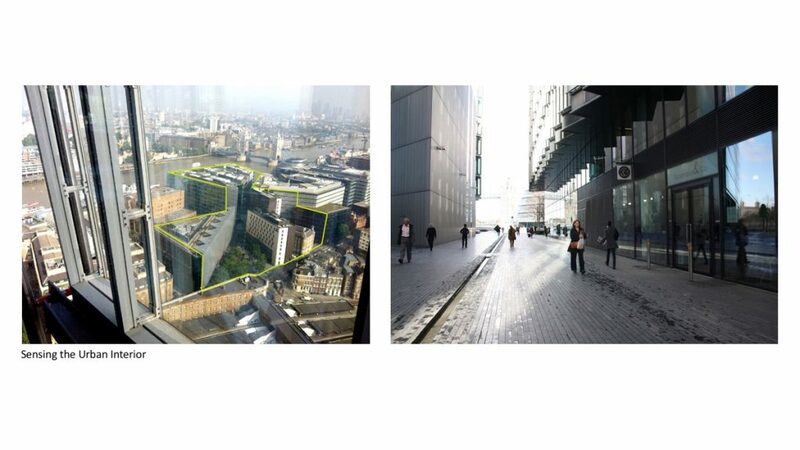 In order to understand how these phenomena occur and how the experience of the urban interior manifests itself in our consciousness, the study follows the Husserlian phenomenological method of intentionality whereby the urban interior of Bermondsey Street becomes the intentional object. It also places the reflective gaze of the phenomenologist in ‘epoché’, a phenomenological method of reduction that suspends normality. In doing so, the phenomenologist is able to access the points of reference that reveal the affective qualities of the intentional object in our consciousness. 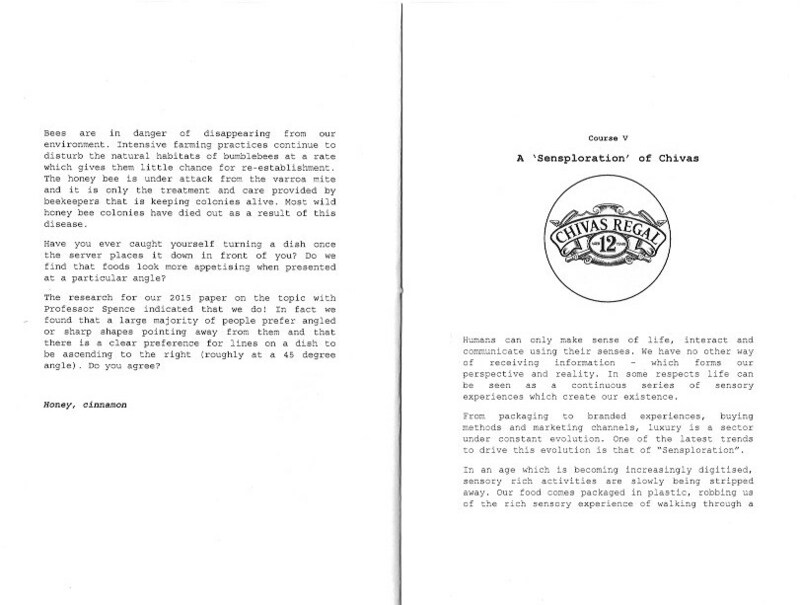 While the discursive and theoretical content of the study is expressed in the body of text, the phenomenological narrative is bracketed and illustrated as a meditative journey; a recollection of memories of the homely, initiated by the encounter between consciousness and the way the interior animates imagination. Thus, in ‘epoché’, the reflective gaze of the phenomenologist transcends normality to reveal the underlying structure of the phenomena and the intentionality of the subjective experience. On Wednesday, I joined a group of people, all complete strangers, for a multi-sensory lunch where each dish was prepared to provide a unique multi sensory experience. Of course, the taste of the food was very important but it was enhanced by varied combinations of colours, textures, presentations, light, sounds which suggested locations (the sea or the forest), and smells (tobacco essence, caramel) which, sprayed around the tables, served to enhance the experience of the food. The first dish was served with headphones for a total immersions, some were completely silent to minimise stimuli and enable diners to appreciate the food more. Sometimes the cutlery changed, as when we were given long tweezers to eat jelly fish (yes, and it was very nice too). Each of the 5 courses was introduced by a short talk by Joseph Youssef from Kitchen Theory and Professor Charles Spence (from the Department of Experimental Psychology at Oxford University) who collaborated on the project. A masterpiece, beautiful; food and great experience. How do colour, aroma, texture and even sound affect how you experience flavour? Why do we like and dislike particular foods? And do we all experience flavour in the same way? The emerging science of ‘gastrophysics’ – the combination of gastronomy and psychophysics – looks to answer all these questions and more. Working in collaboration with Oxford University Professor of Experimental Psychology, Charles Spence, multi-sensory gastronomy experience designers Kitchen Theory, have ‘commandeered’ the Studio at London’s ANdAZ Liverpool Street Hotel to create the ultimate foodie senseploration. Featuring a five course lunch, guests are invited to experience food in a whole new way. Do certain foods taste sweeter while stroking velvet? Will ‘sonic seasoning’ one day replace the salt cellar? If you can’t smell a meal, what happens to your experience of flavour? Preconceptions will be challenged, while all of your senses will be stimulated. Prepare to walk away with actionable insights that you can apply in your own kitchen.